Here it is! 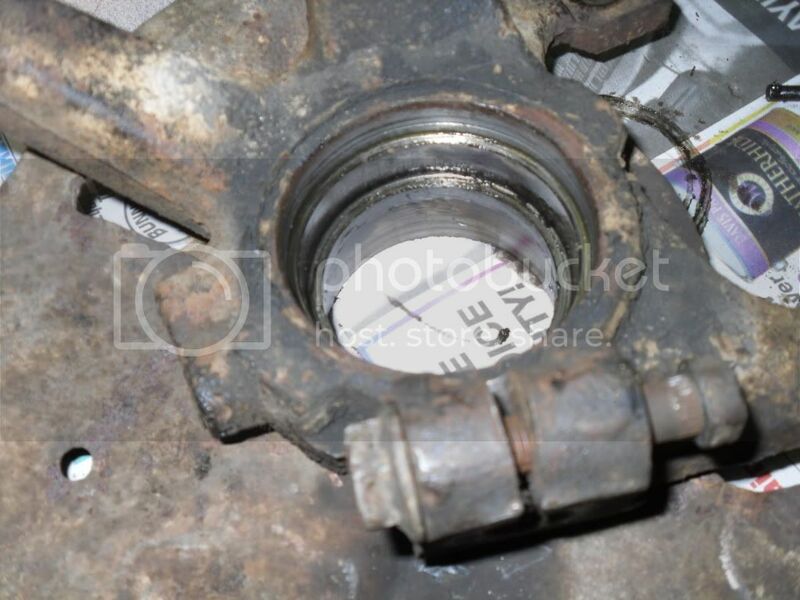 Detailed pics of front wheel bearing replacement on a '95 Aspire! Note: I know my parts are worn, so please leave out comments about my equipment. Raise the vehicle and remove the tire. 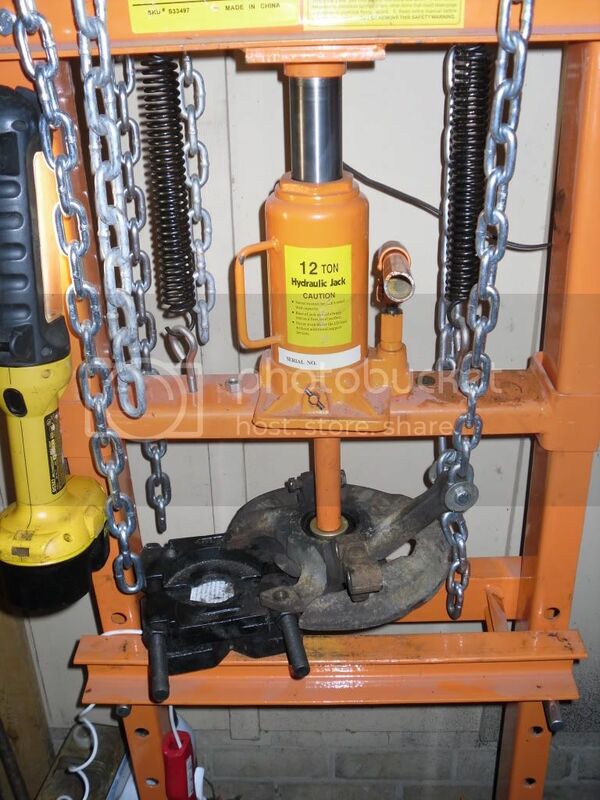 Place the vehicle on a jack stand or similiar. For safety sake, do not leave the vehicle on jack. 2. Have some apply the brakes on the car. Open the chiseled indention on the crunch nut and remove it. I used a flat head screw driver to open the chiseled indention. 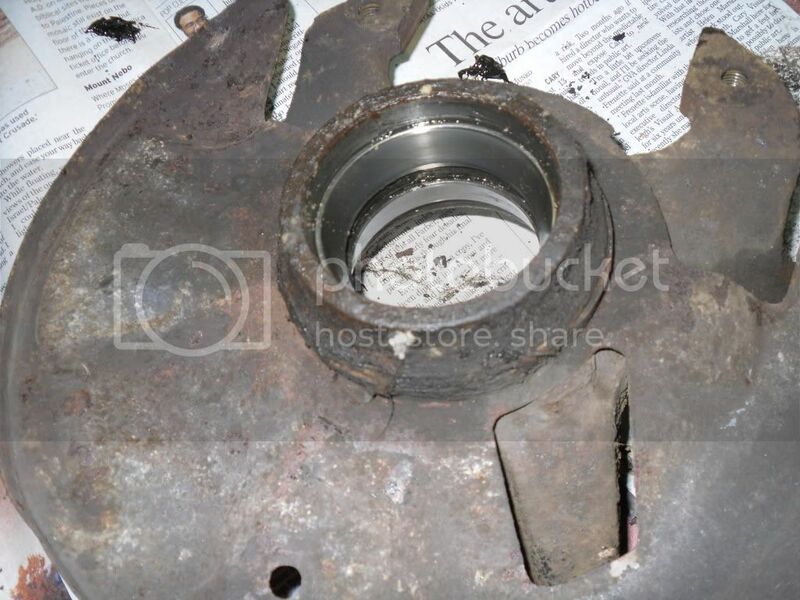 Make sure you open it entirely so that it does not scrape as the nut comes off. 3. 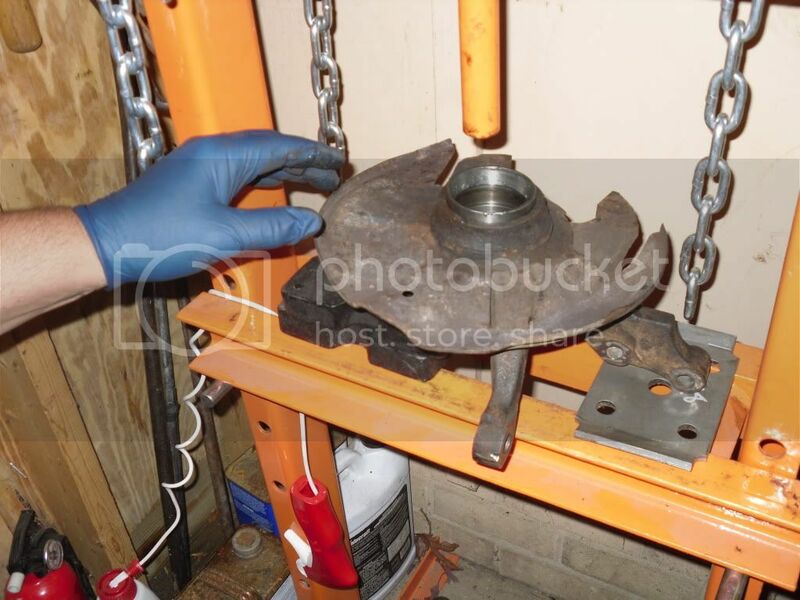 The OEM Ford manual has you leave the brake unit on the car until later. I chose to remove it now to get it out of the way. To me, this was a better choice. 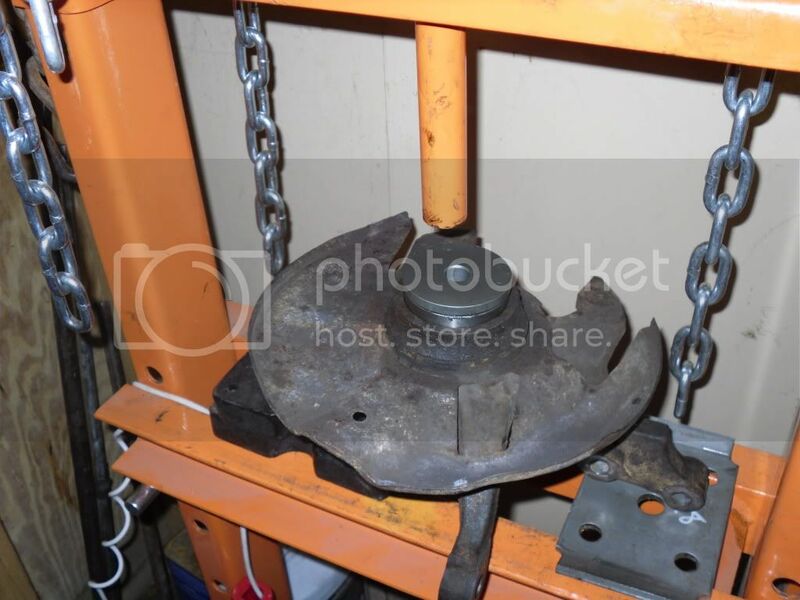 There are two bolts that hold the brake unit onto the rotor. 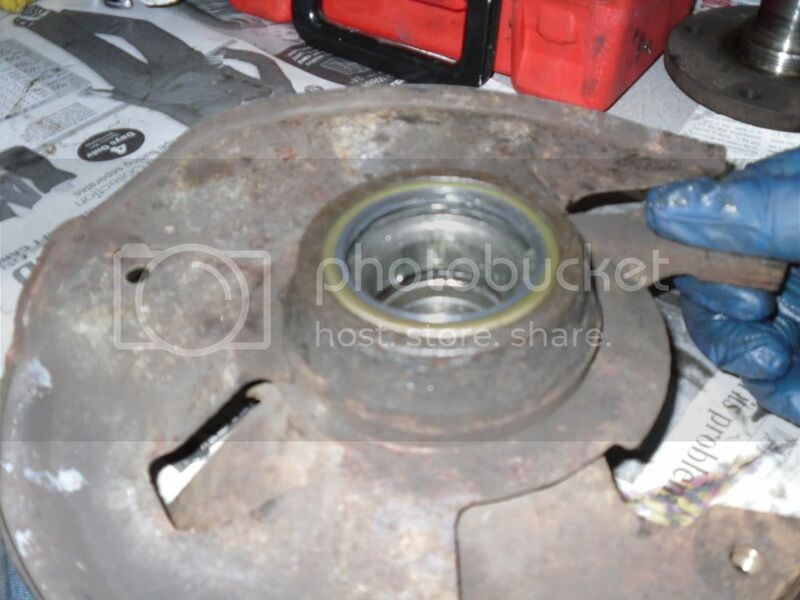 Once those two bolts were removed, I bled the brake unit into a bleeder bottle so I could loosen the brake shoes from the rotor. 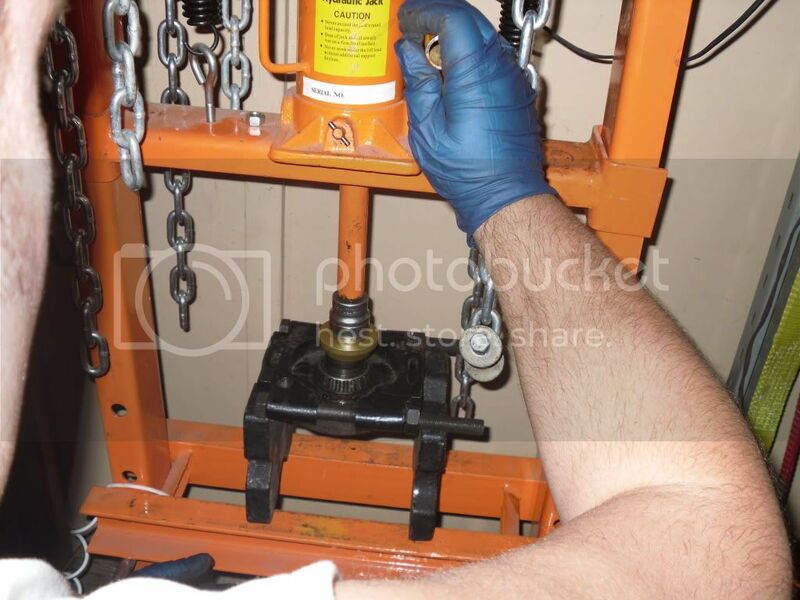 This can be done by opening the small bleeder valve near the top mount bolt of the brake unit. 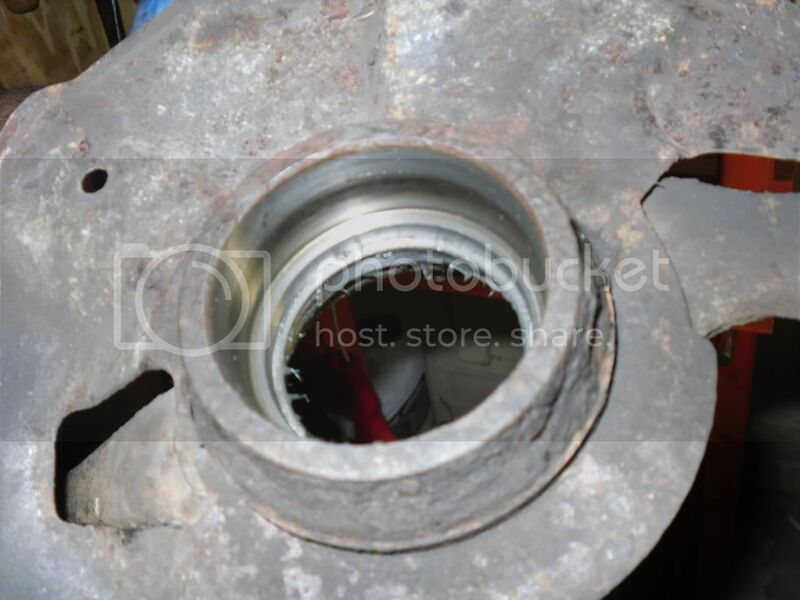 This bleeder valve should have a rubber peice covering the opening of the valve. This is to protect it from the eliments. 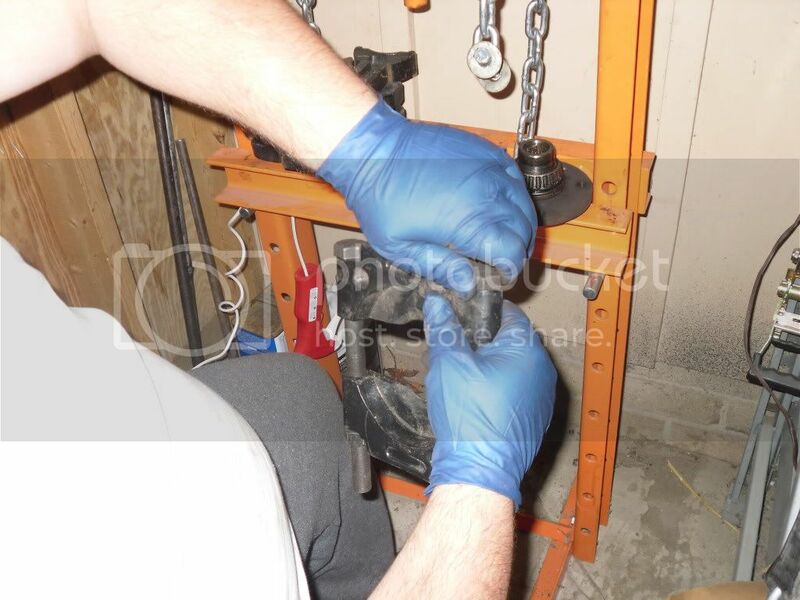 Once this valve is open, gently pull the brake unit toward you. 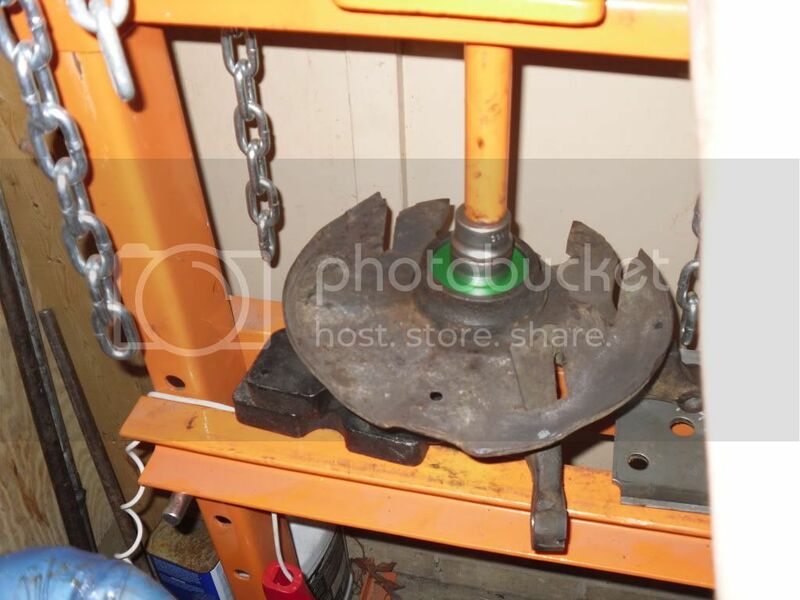 This compresses the part that squeezes the brakes onto the rotor and allows you to remove the brake unit from the rotor. 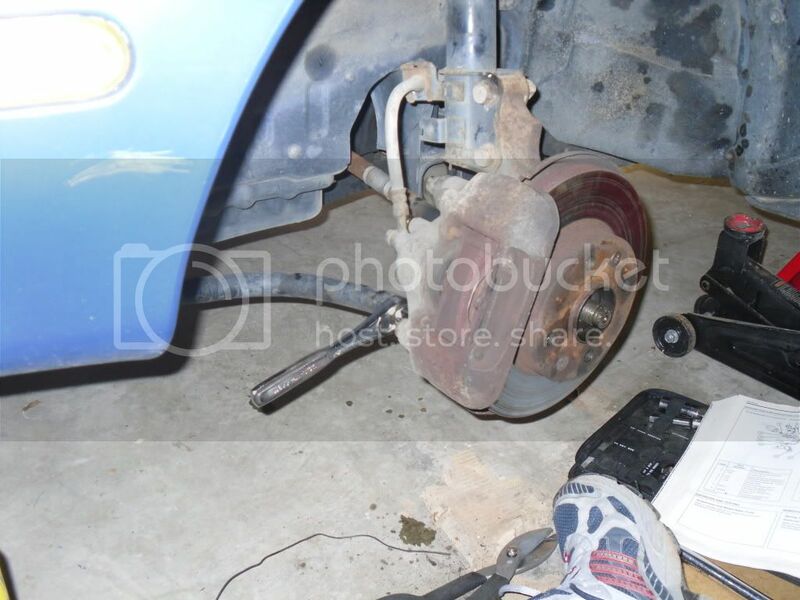 I used wire to tie the brake unit up and out of the way. 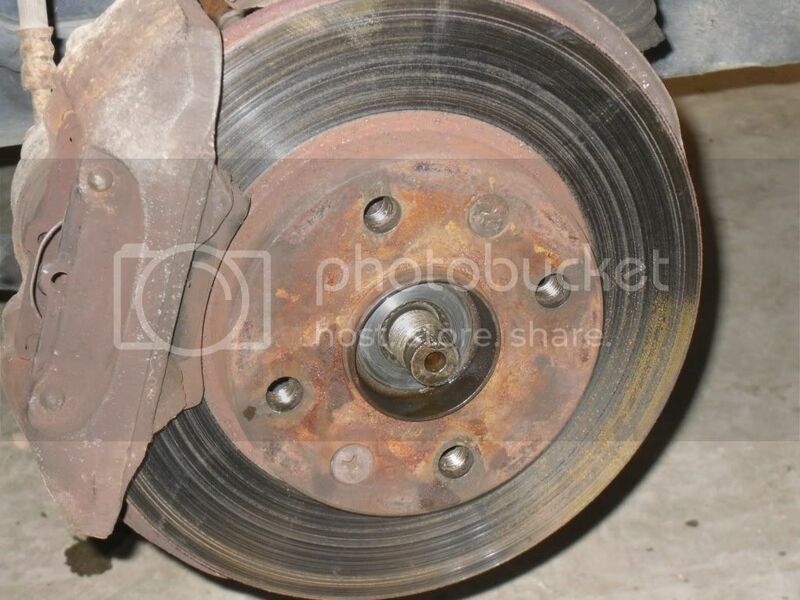 Do not touch the brake pads or rotor with greasy fingers. 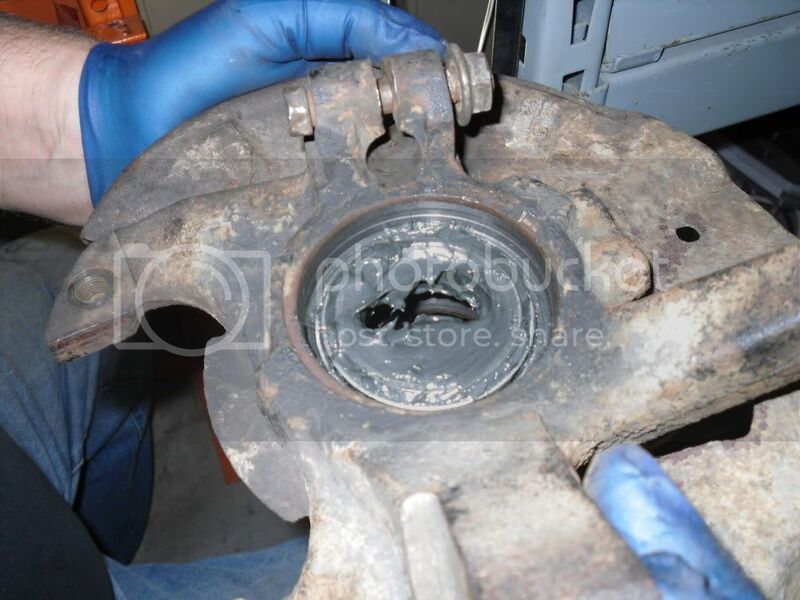 Also, do not let the brake unit "hang" only by the brake line. This will cause damage! 4. 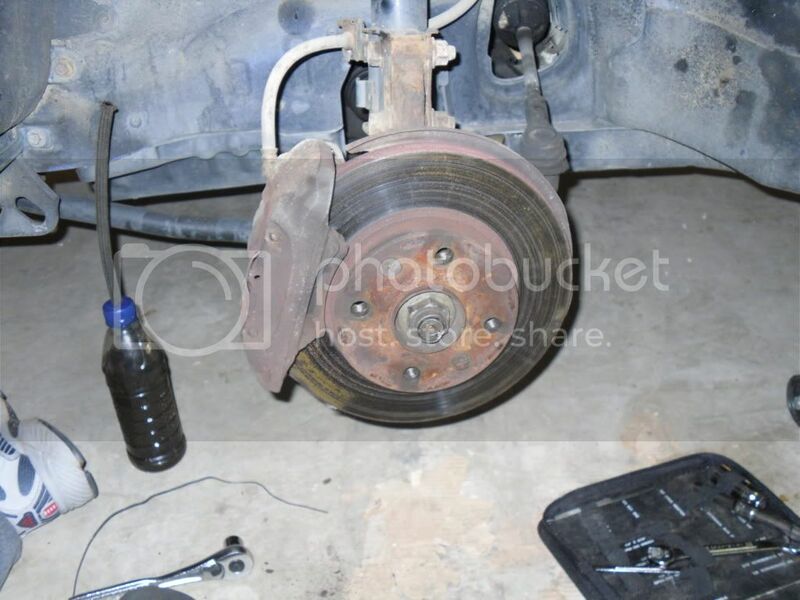 Remove the two screws that hold the rotor onto the car. 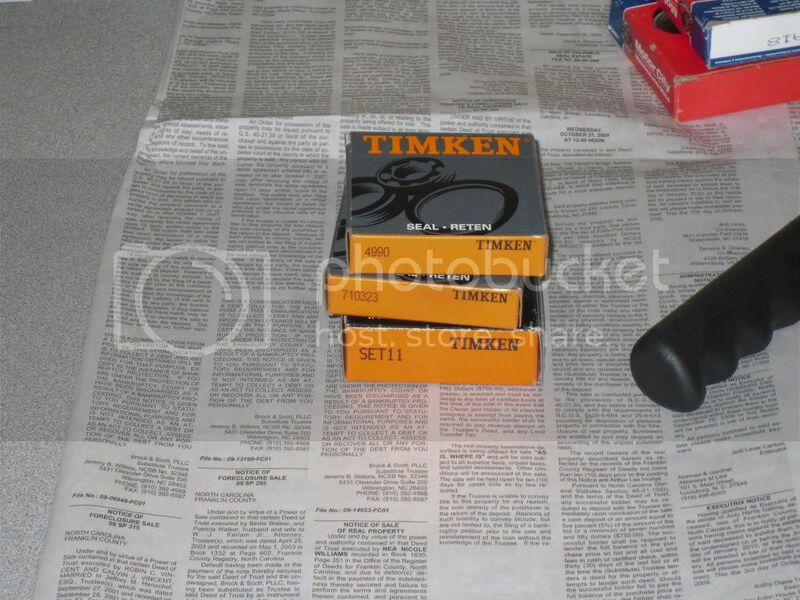 Once I removed mine, I stood it up against the wall. I did not lay it on the ground. 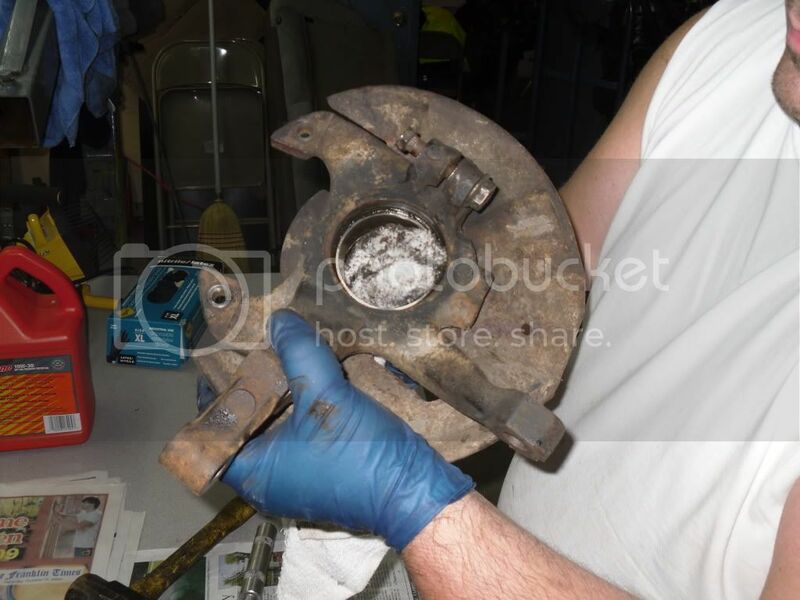 Remember, this what your brake pads clamp onto. Do not touch with greasy fingers or lay it in dirt! 5. 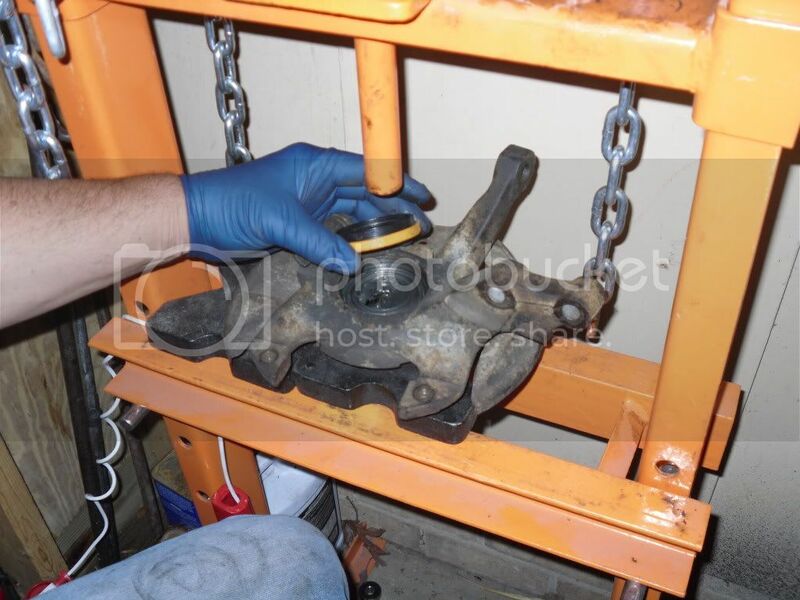 You are going to need to remove the cotter pin and nut that attaches the tie rod to the knuckle. 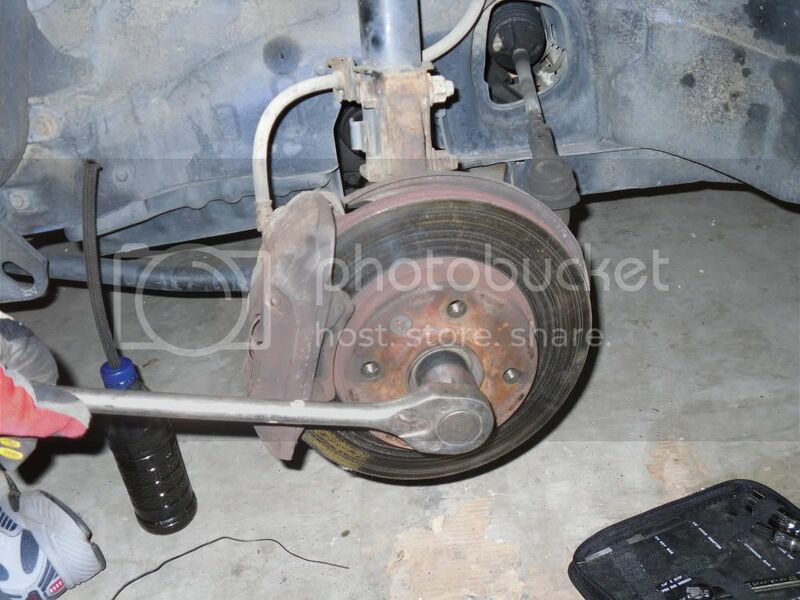 NOTE: Once the tie rod is removed, do not allow the tie rod end to "move". Basically, this is your car's alignment. 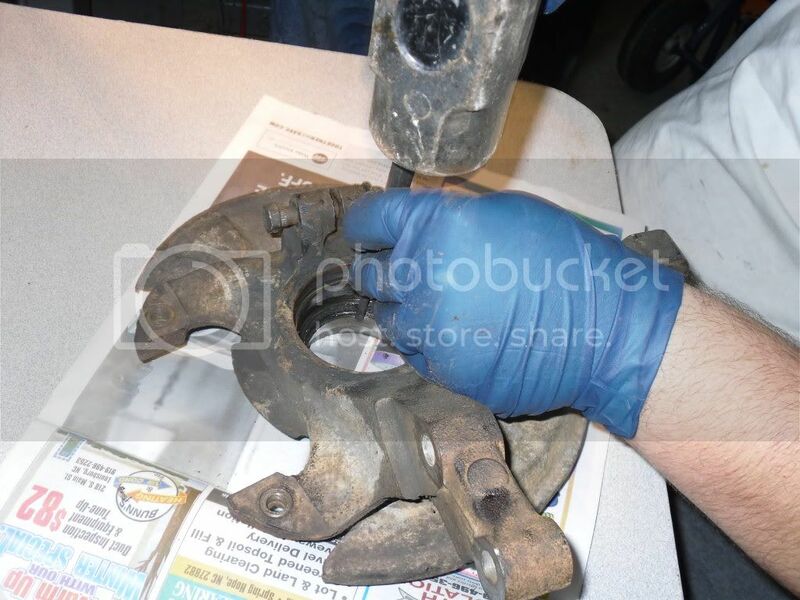 The tie rod end is threaded onto the tie rod. This is how alignment is adjusted. Move it and your car will be "out of align". 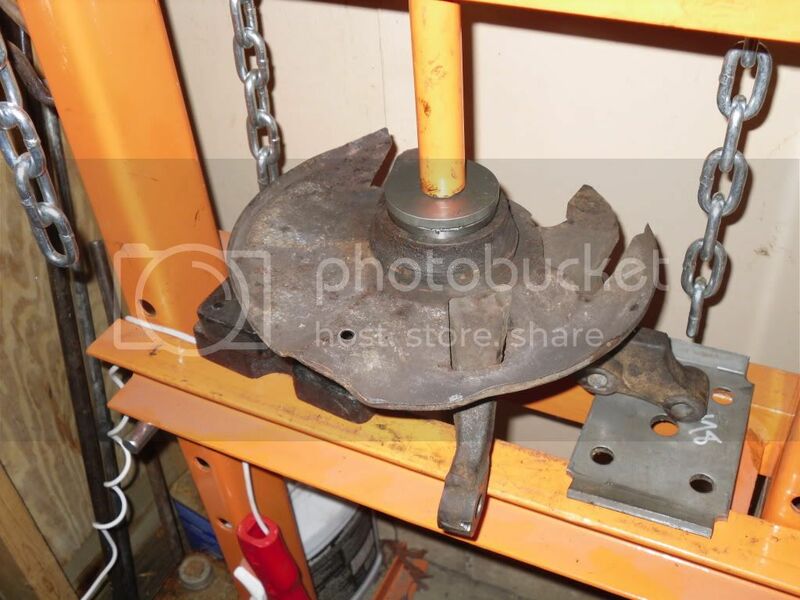 I later learned that I need to replace my tie rod ends (this unit mentioned). 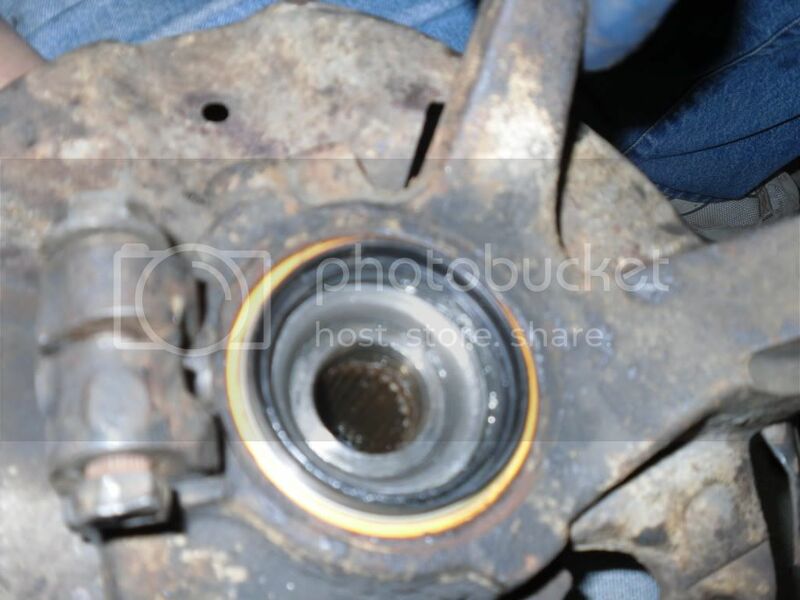 Good luck trying to find any bushing replacement parts. 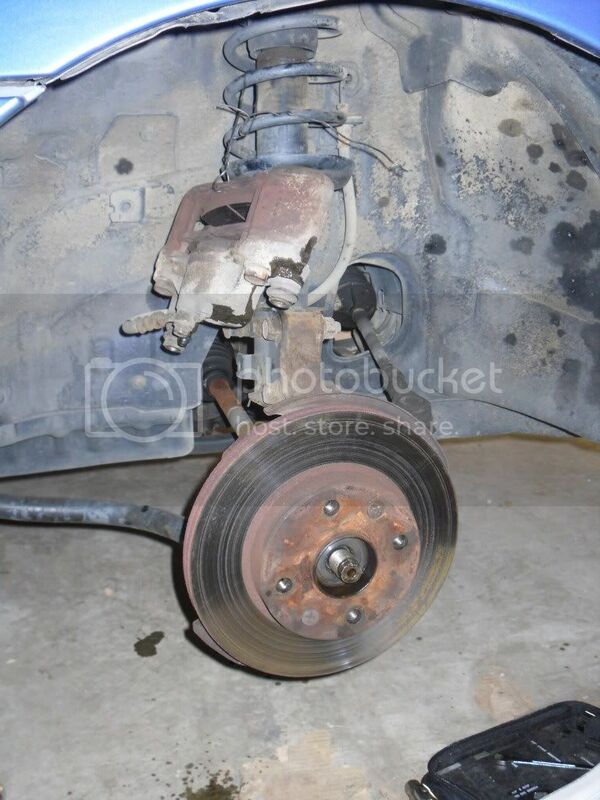 Allow the tie rod to lower and lay it out of the way. 6. 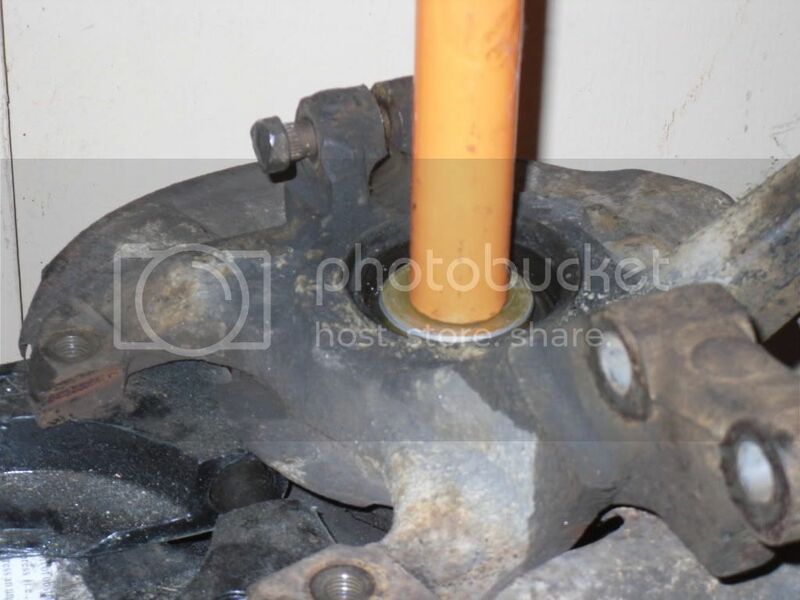 Loosen the two mounting bolts that are part of the strut tower. I loosened them, but did not remove them at this point. 7. 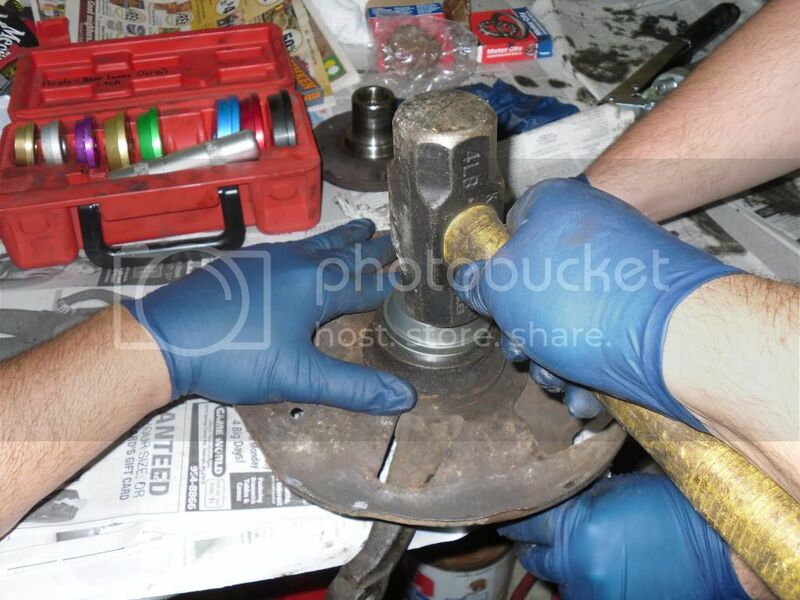 Remove the lower pinch bolt that holds the knuckle onto the ball joint. 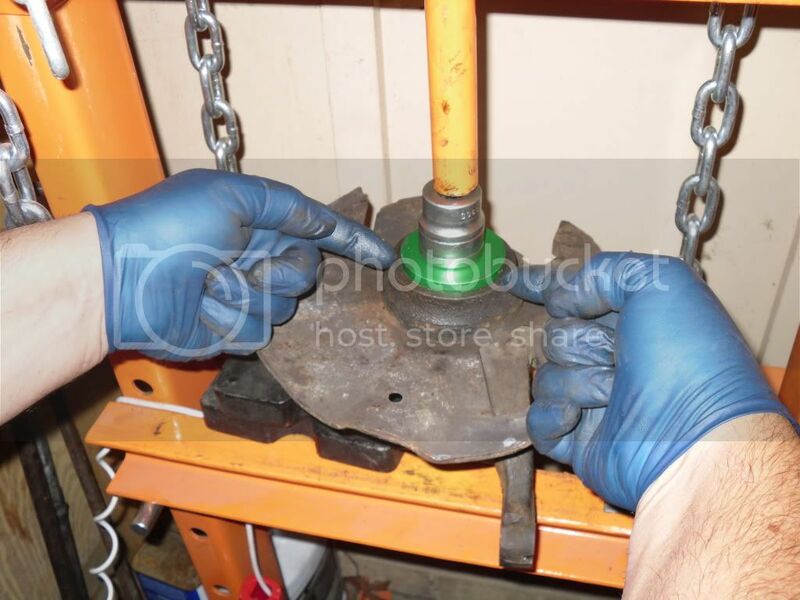 NOTE: A medium flat head screw driver might be needed to slightly pry open the pinch bolt area around the ball joint to allow the unit to be removed. 8. This got tricky and I had to call Dean to get some advice. 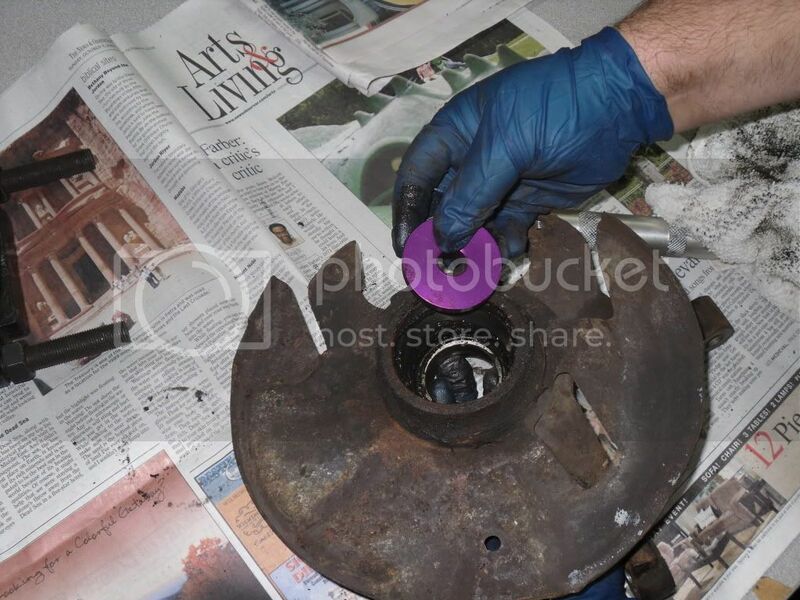 I could not get the knuckle off of the ball joint without pulling the CV axle out of the transmission. 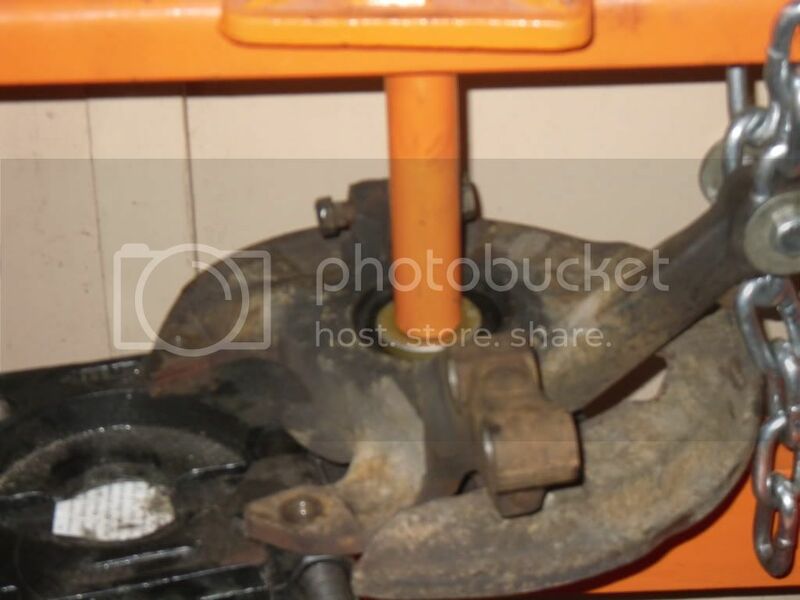 Suggestion, now that the knuckle is loose from the steering, turn it so that you can see the drive axle inserted into the knuckle. 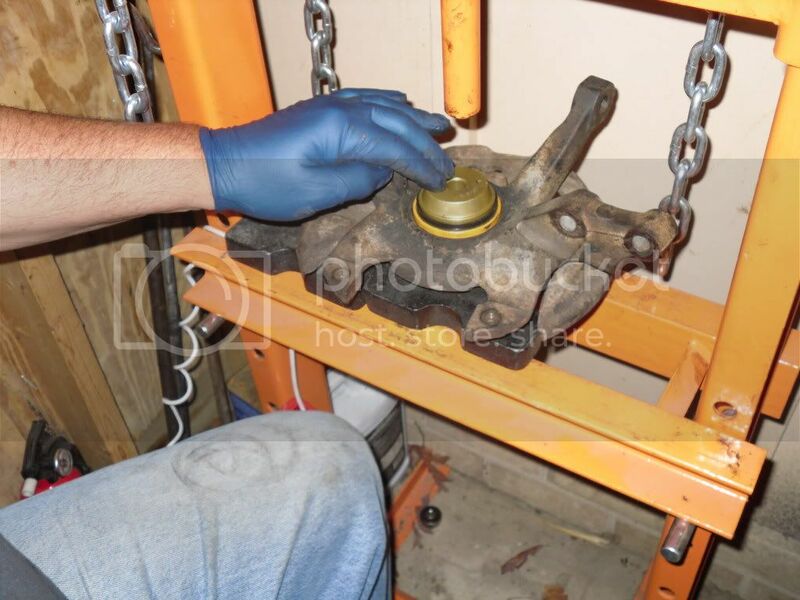 If you push the axle toward the transmission, you will see that it "gives" a bit and is sort of "springy". 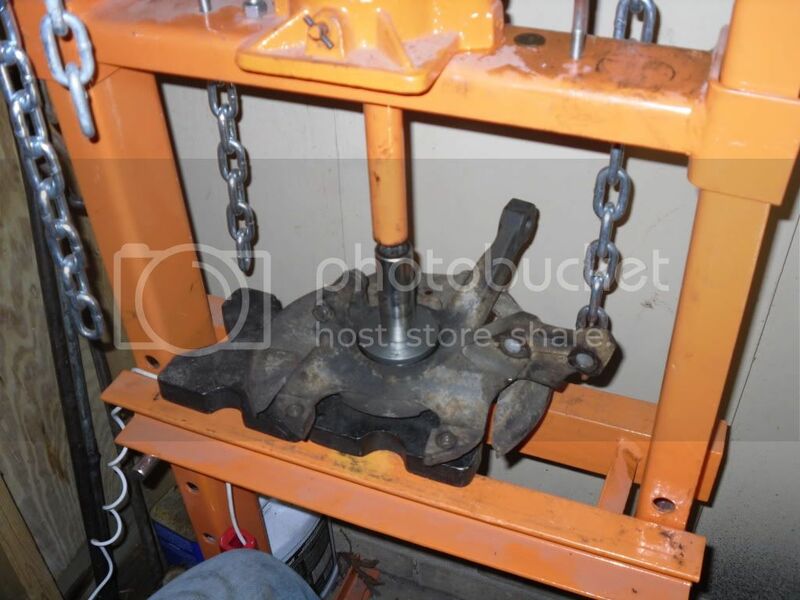 I pushed it toward the transmission and was able to remove the drive shaft from the back of the knuckle. 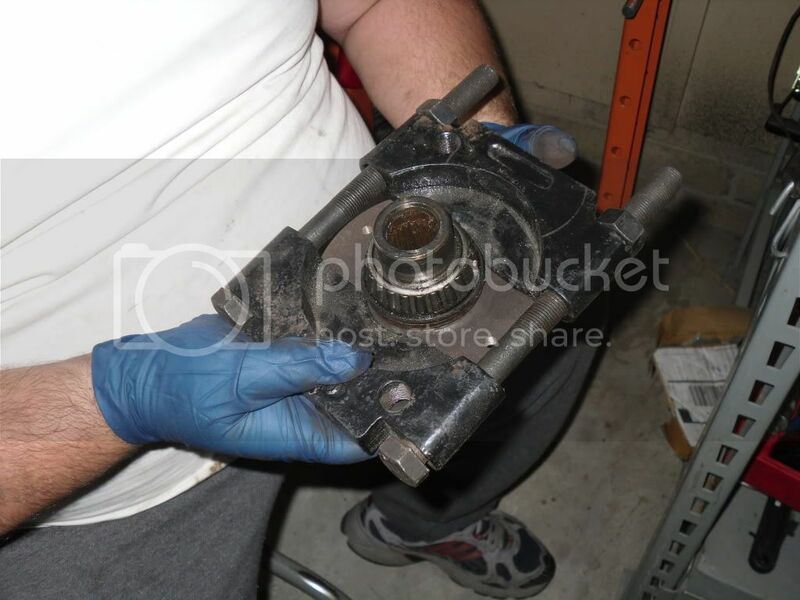 The knuckle itself, tilts outward just a bit and this helped in this process. 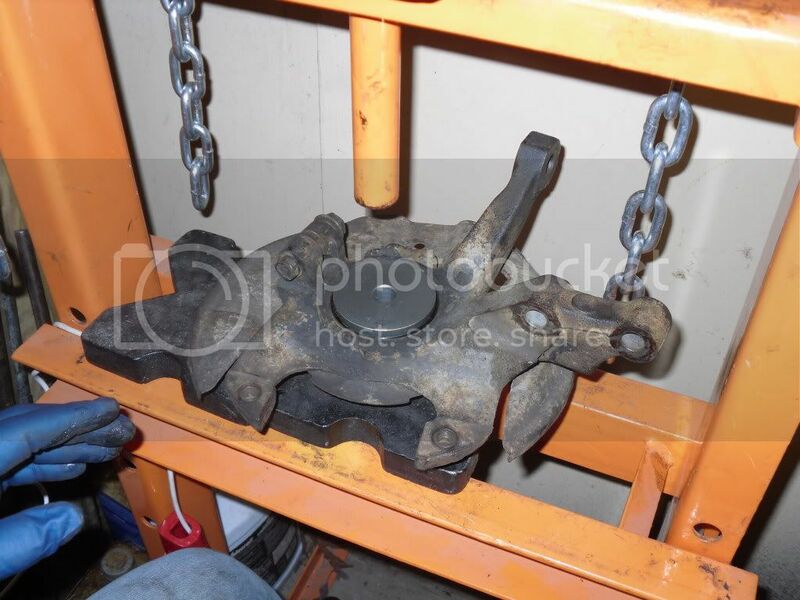 You can see where I tried to just pull the knuckle up off of the ball joint and it resulted in pulling the axle out of the transmission. Avoid doing this if possible! 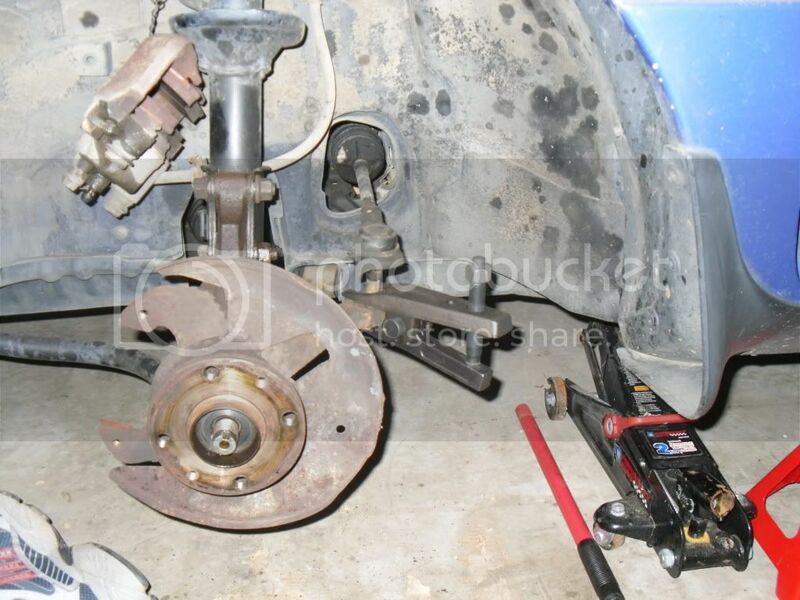 Once the axle was out of the knuckle, I then tilted the whole unit toward me by pushing downward on the lower control arm and lifting the knuckle off of the ball joint. This may not seem clear, but you will see what I'm talking about once you are at this step. 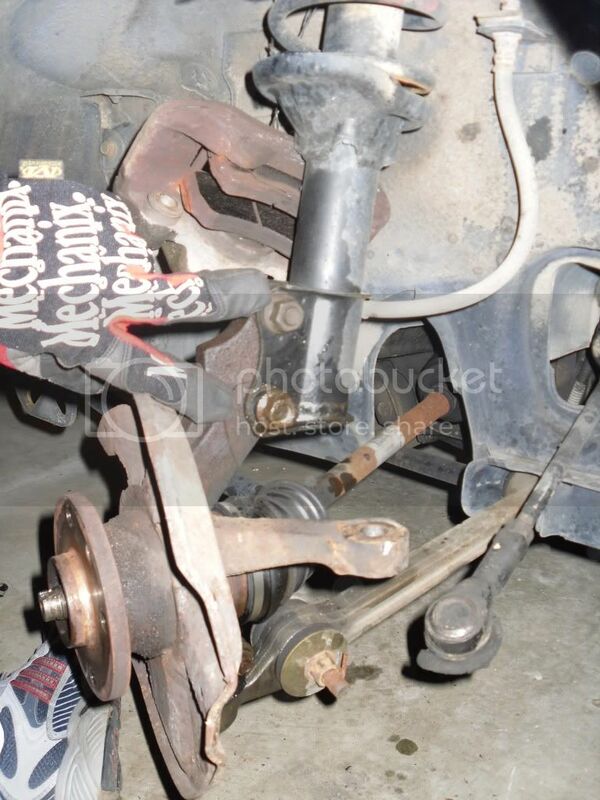 The lower control arm and sway bar allowed me some "wiggle" room to get the knuckle off of the ball joint. Igore my transmission spill in the pic! 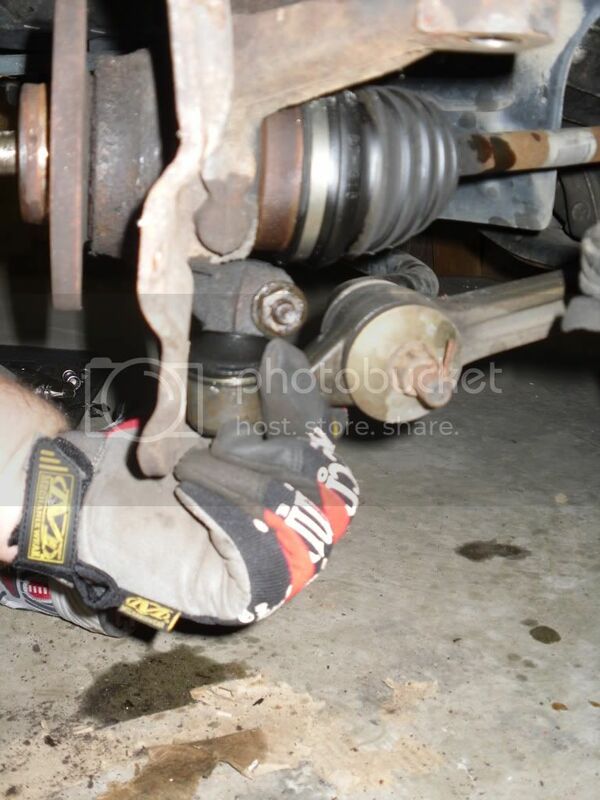 In this picture, you see the drive axle and enclosed cv joint laying over the sway bar. 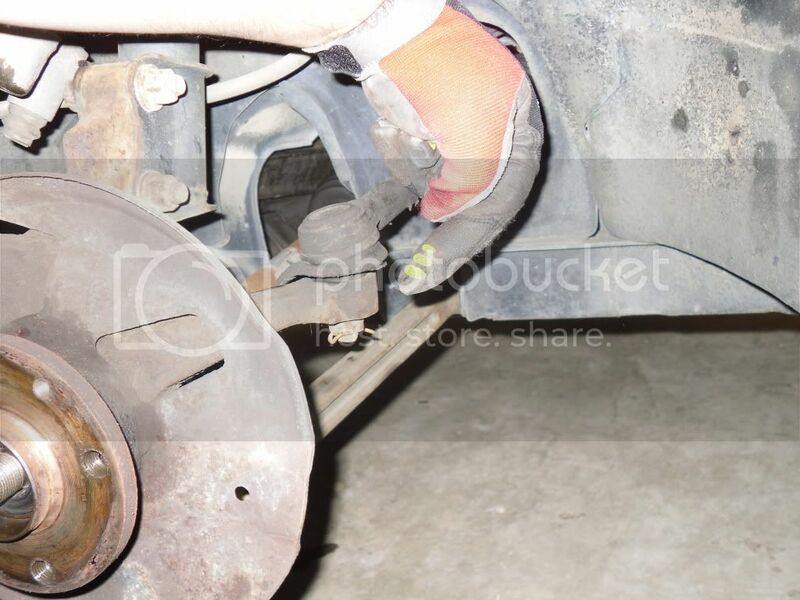 The sway bar is attached to the lower control arm and ball joint. This is one unit on the Aspire. 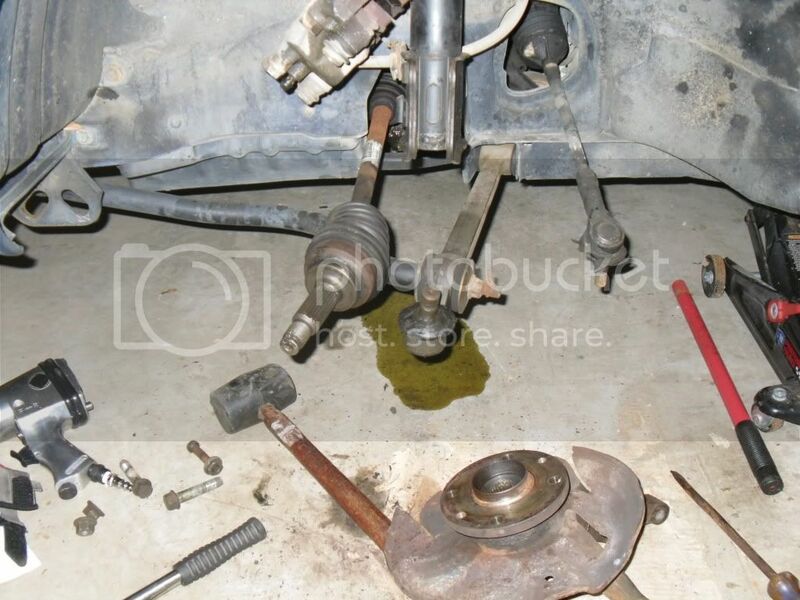 The the far right is the tie rod. 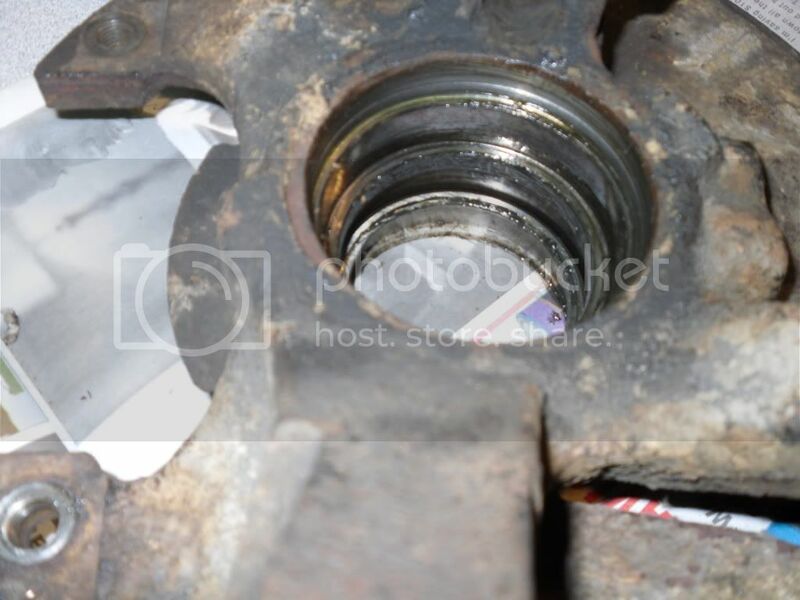 You are now ready to remove the bearings! We used a press in the steps that follow. 9. 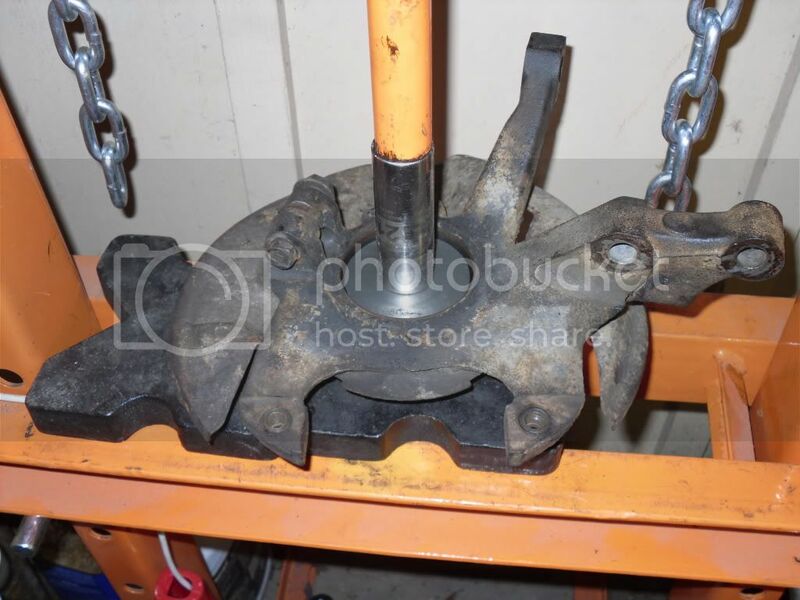 First, you have to seperate the spindle from the hub. almost there... There it is! Plop... out it came from the bottom. 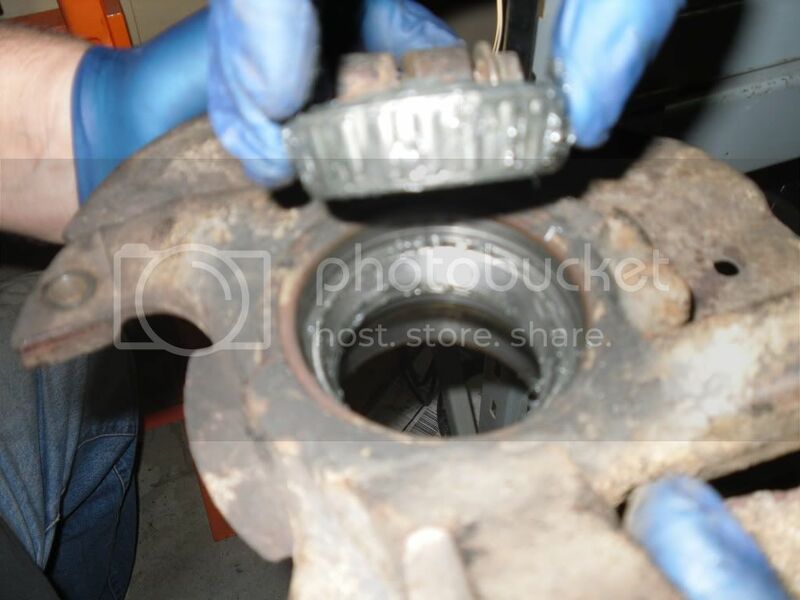 Take a close look... right above the wheel bearing is a small metal ring that easliy slides off off... this was actually the spacer! Spacers range in size from 1-21 (I believe)... mine was a 13. DON'T LOSE THIS PEICE! Remove it and set it aside. 11. 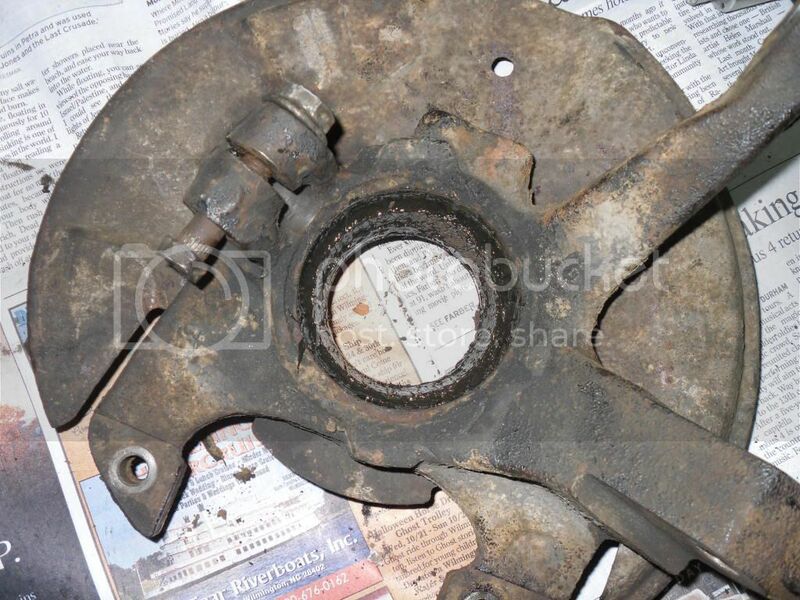 Now we have to remove the inner wheel bearing. 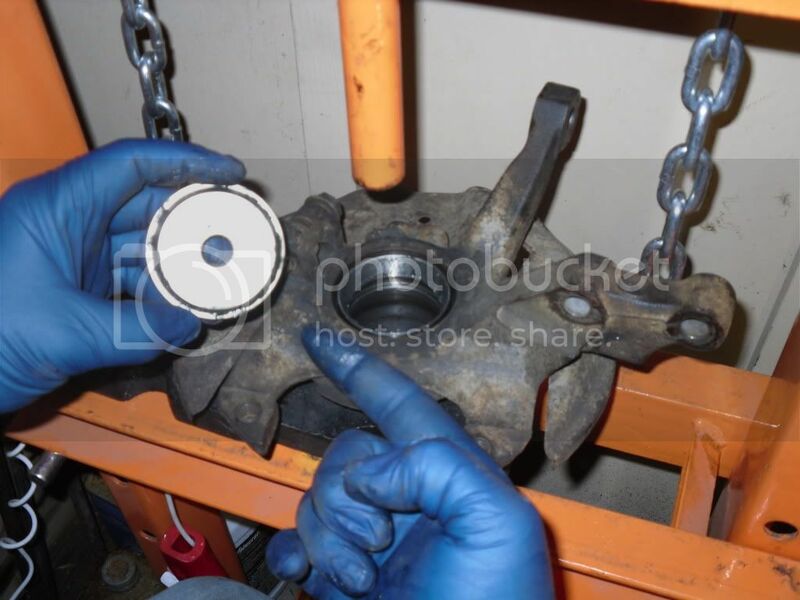 Since the outer wheel bearing and spindle are now out of the way, flip over the knuckle and press out the inner wheel bearing. Sorry, no pic for this step. We did the same thing as in the pics above. 12. 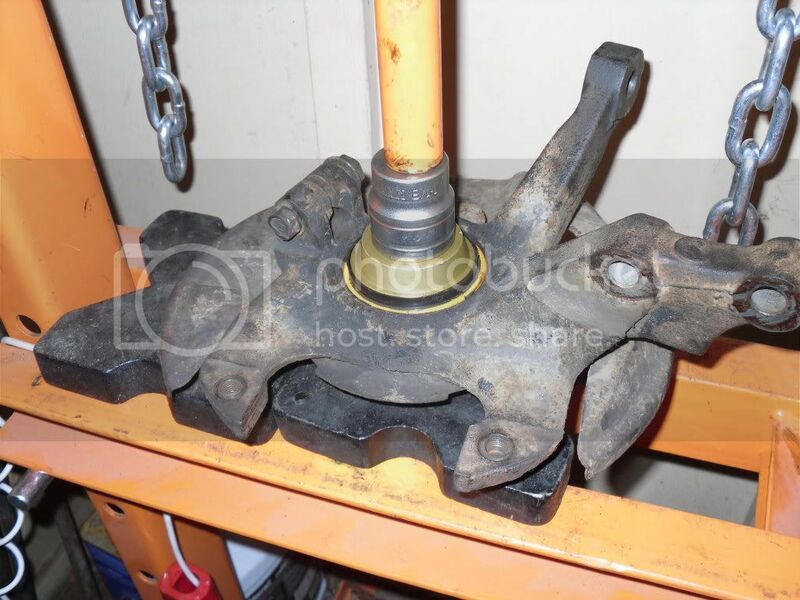 Now we have to remove the outer wheel bearing from the spindle. 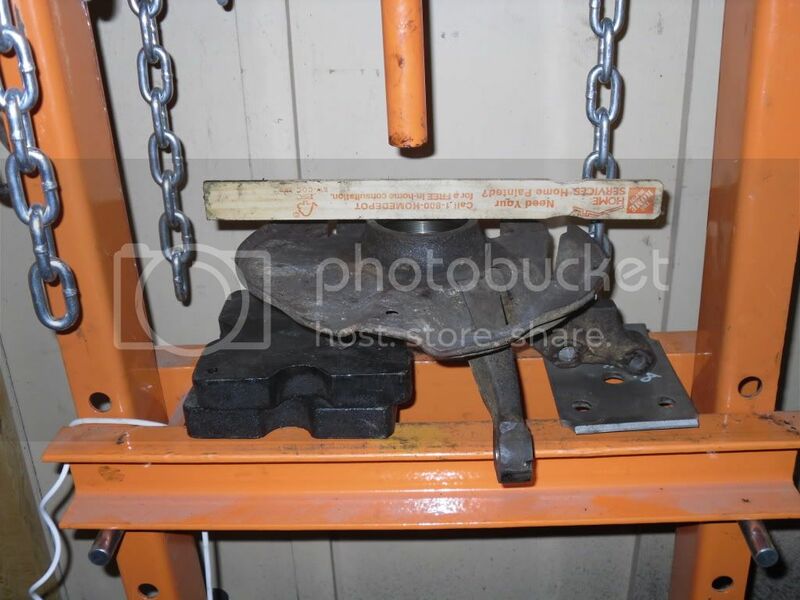 We used a wheel bearing puller device for this step. 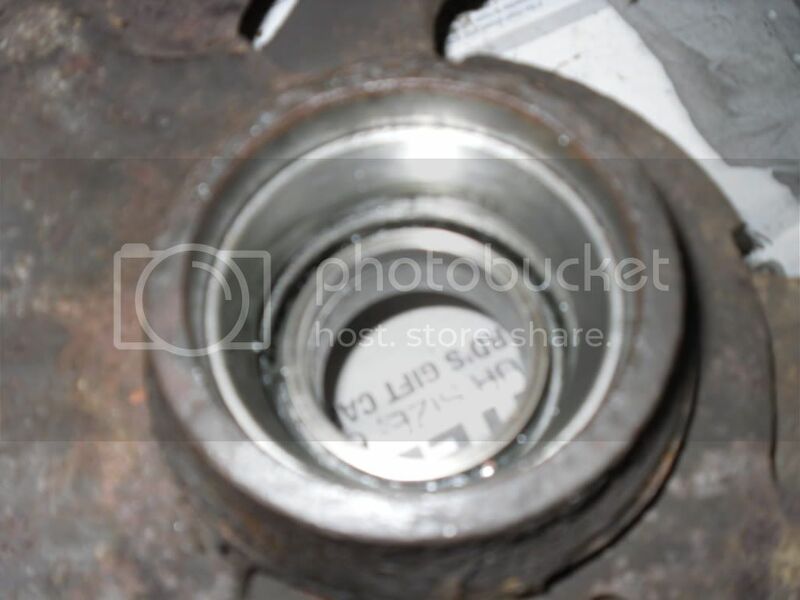 This goes underneath the bearings in that small space shown here. As we pressed, I noticed a metal peice bend a little bit. Turned out this was a seal that needs to be replaced later on anyway. So, don't worry about it. 14. 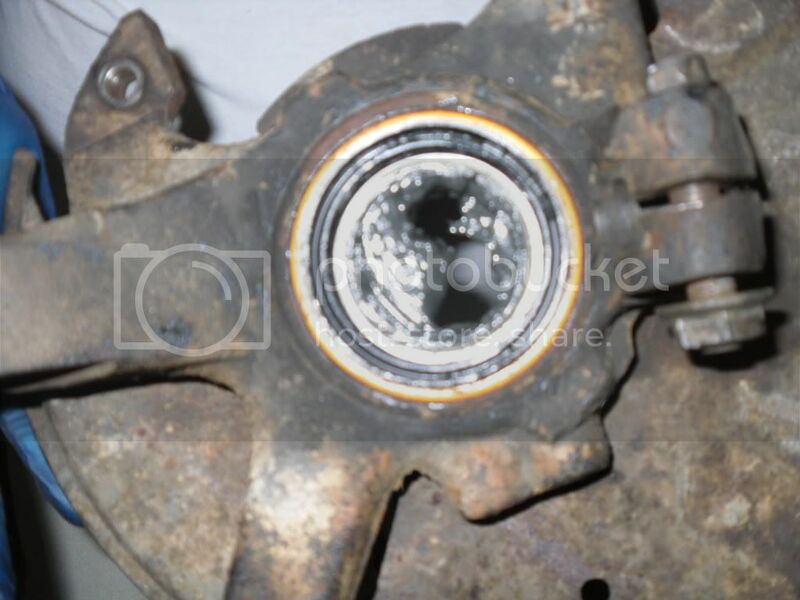 At this point, all you have done is removed the spacer, the inner and outer wheel bearings... but the races still need to be removed! What is a race? The race is what the wheel bearings actually roll on. 15. 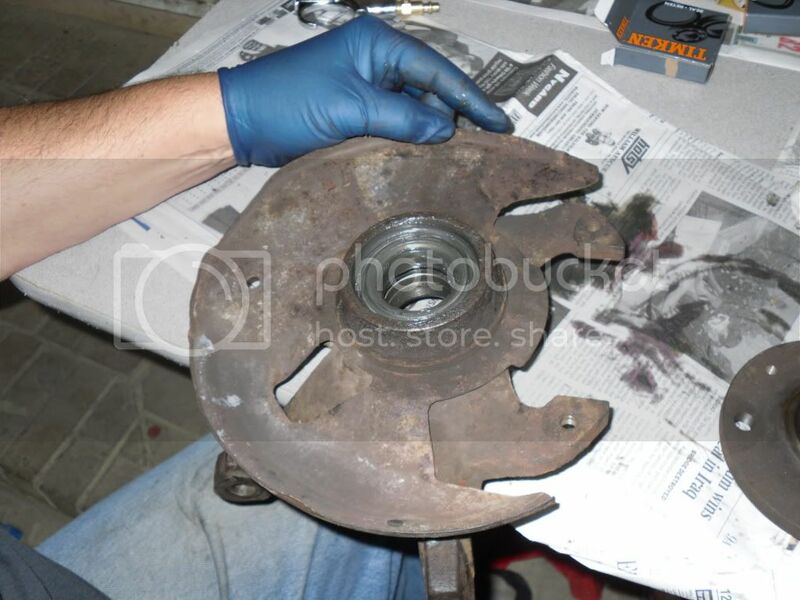 Here, we are pressing out the inner bearing race. And give everything a good whipe down so you can see what you're actually working on! 16. 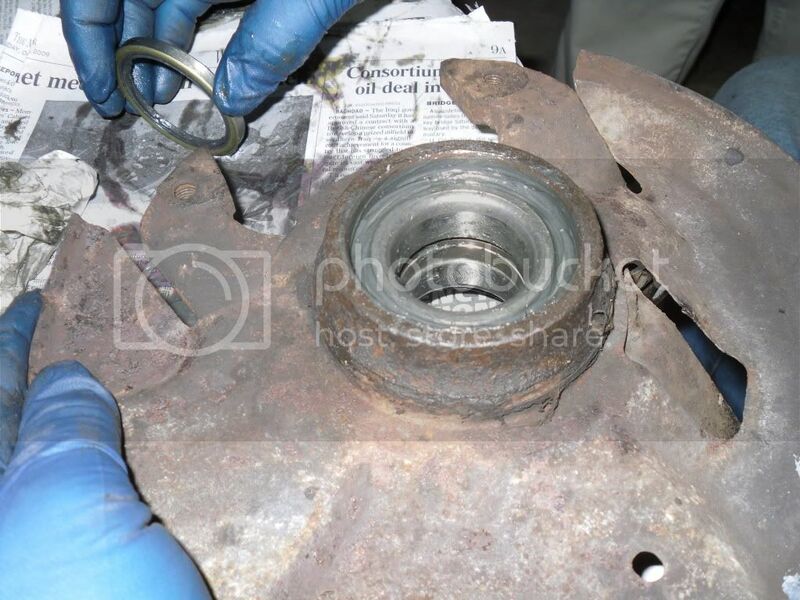 Now you are ready to remove the outer wheel bearing race. Do note that there is a section that looks like something you need to press out, but in face, it's how the knuckle is built. 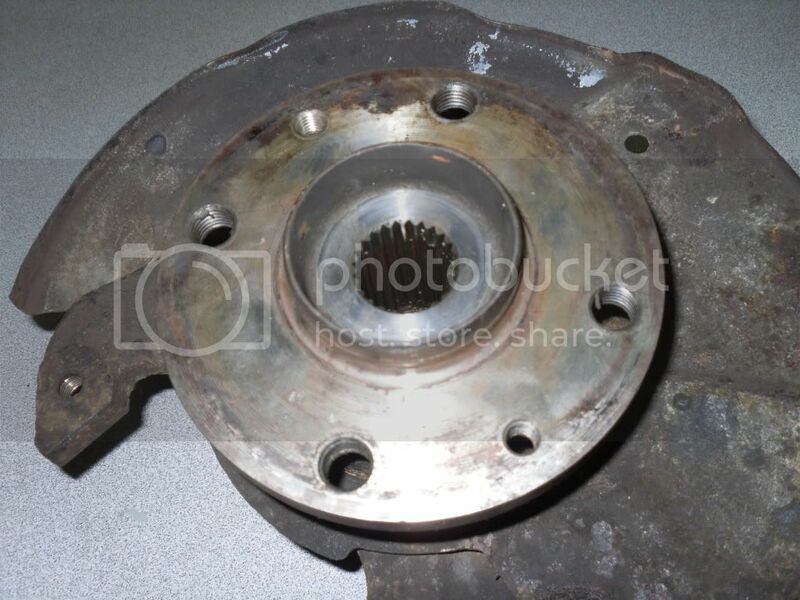 There is a section that seperates the two wheel bearings that is not removable. 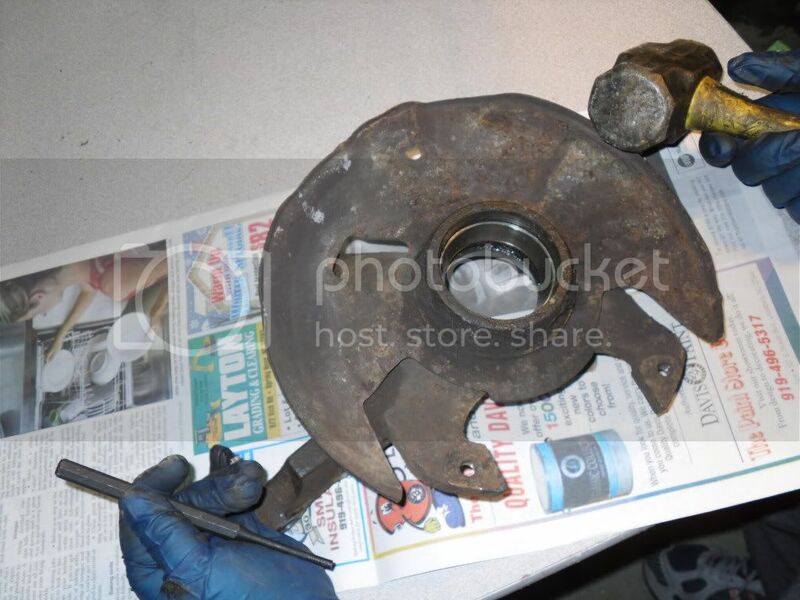 Time to remove that outer bearing race. 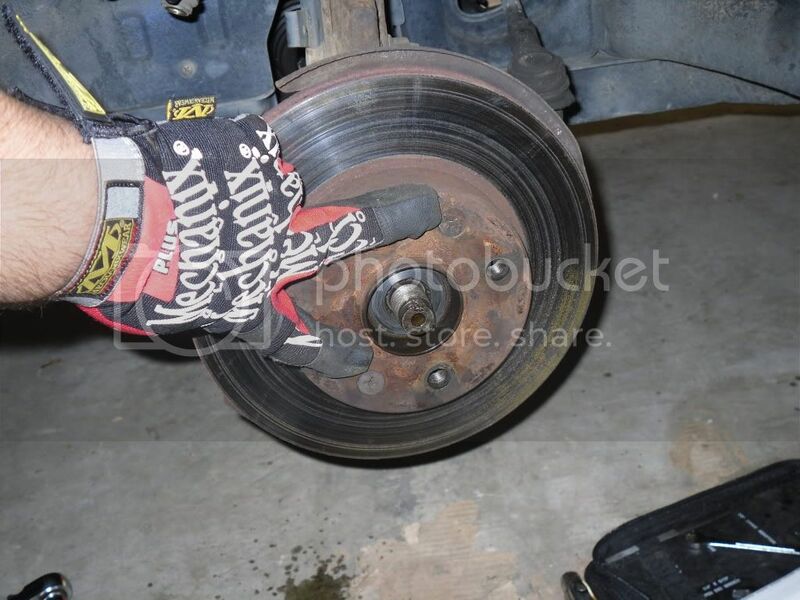 Flip over the knuckle so that it's laying flat side down. I used a blunt chisel and hammer to remove the outer race. Tap very lightly at 9 and 3 o'clock. Alternating between each tap from side to side. BE CAREFUL! You do not want to wedge this race crooked. So go in small steps here. Do not use a lot of force at this step. Small increments is the key! Check you work often! 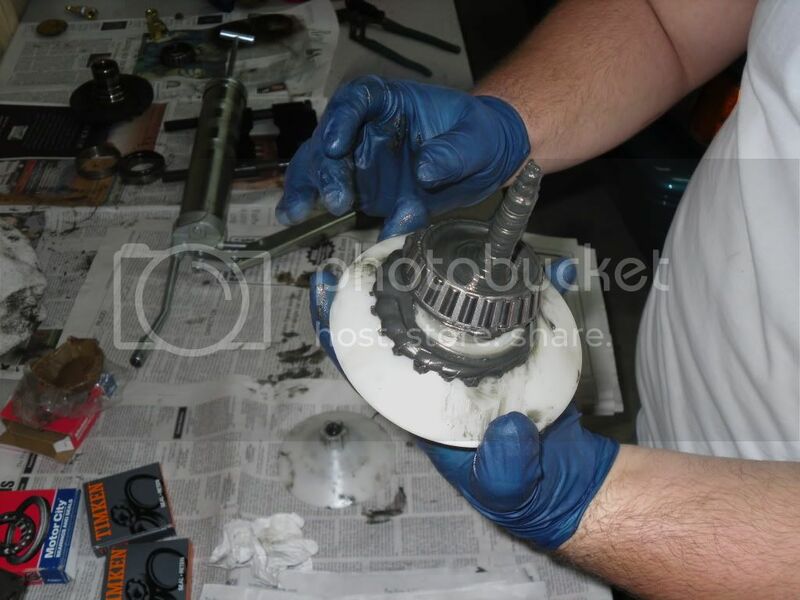 Make sure you clean out every knook and cranny on the knuckle interior. 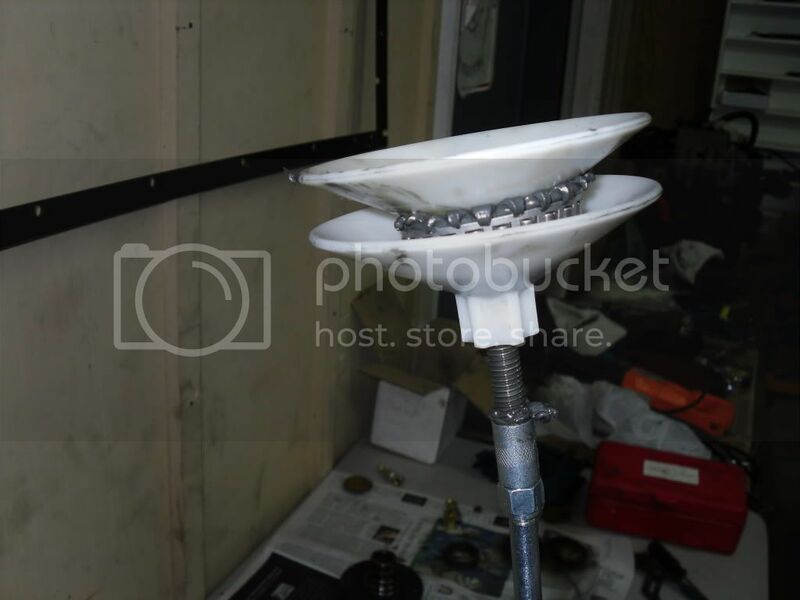 You don't want any metal shavings or peices to ruin all of your hard work! Stop here. Clean up your work area. 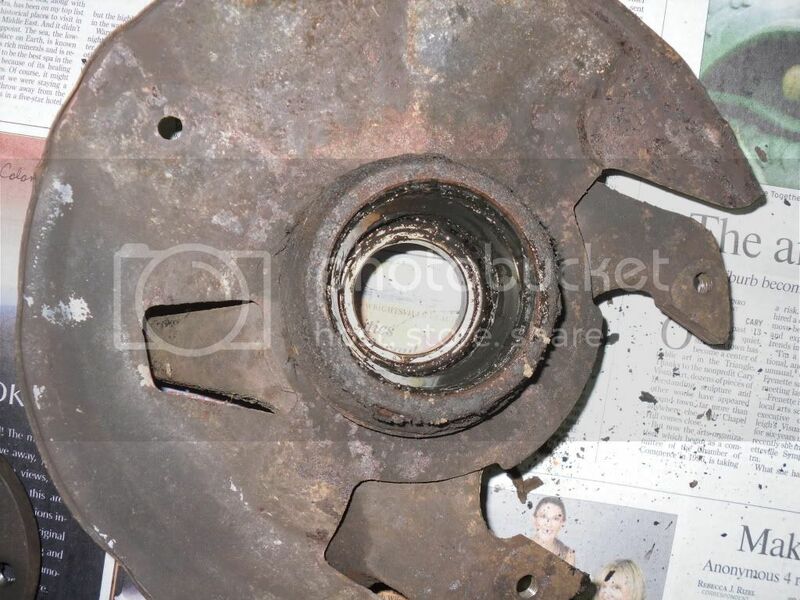 You don't want any debris getting into the new bearings. So don't even open the new bearing packages until later. Clean the area thoroughly and change your gloves! 17. The finish line is near! 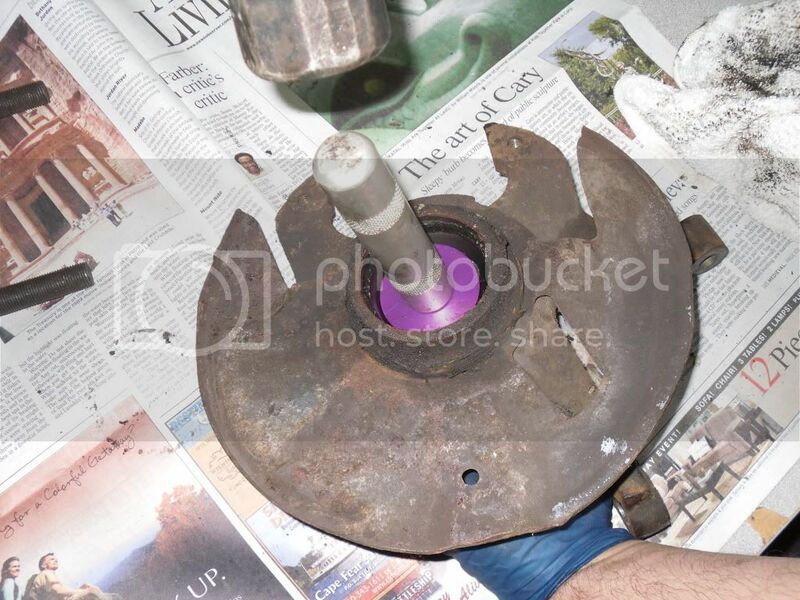 Now, prepare you new wheel bearings for installation. They need grease! 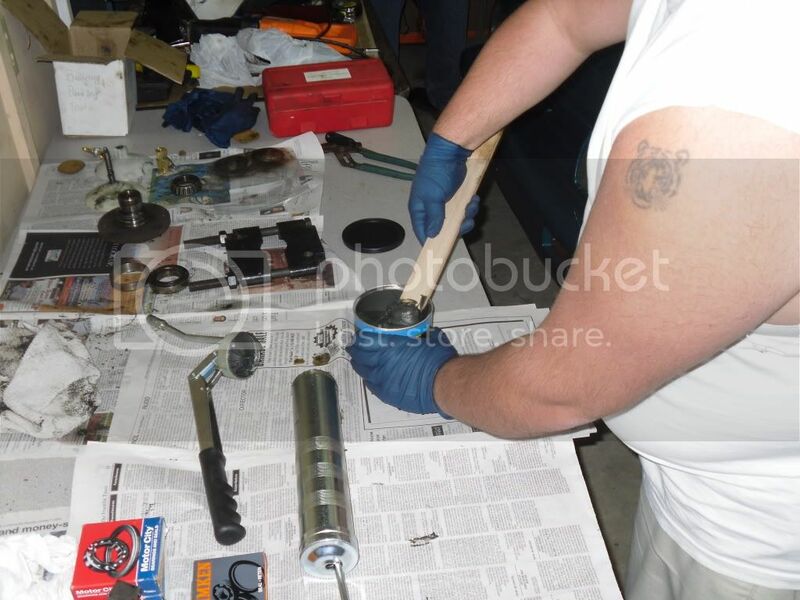 Time to load the grease gun! 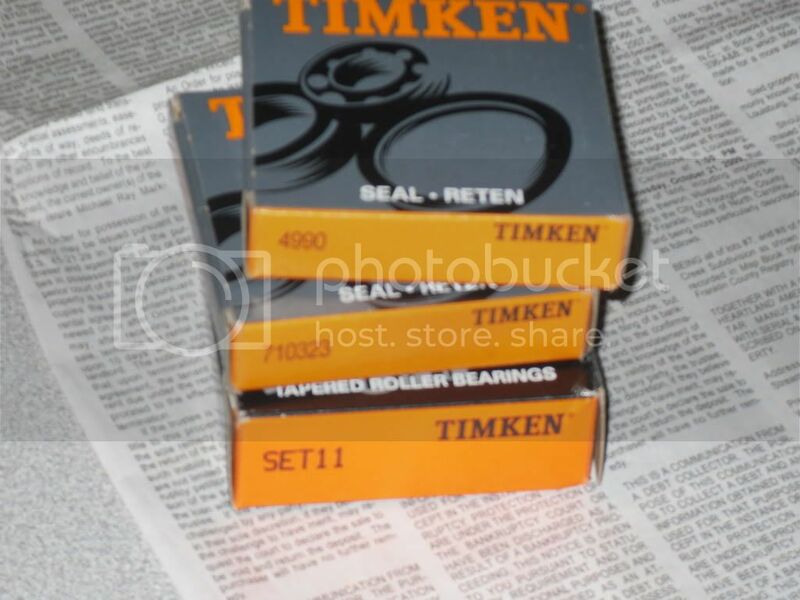 Do not open the new bearings until you are ready to use them! 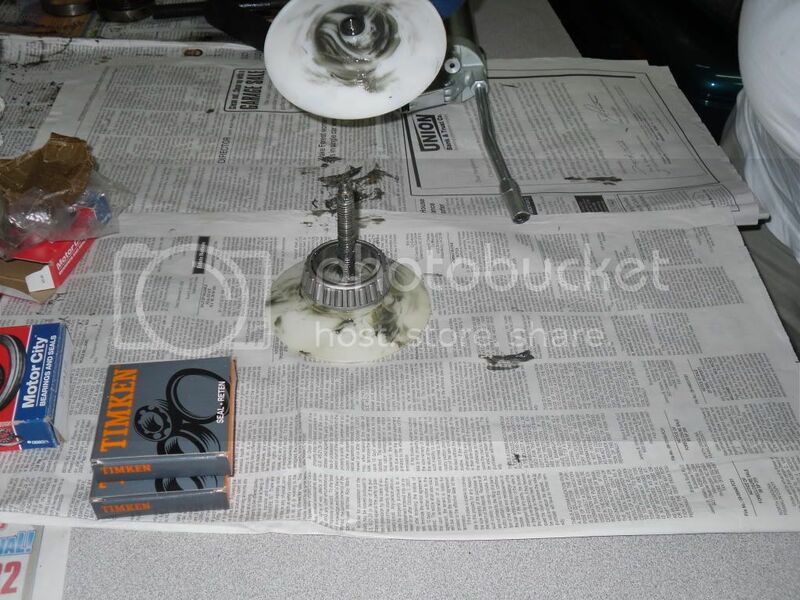 The bearing kit comes in a plastic baggy with the bearing wrapped in paper and layed into the race. 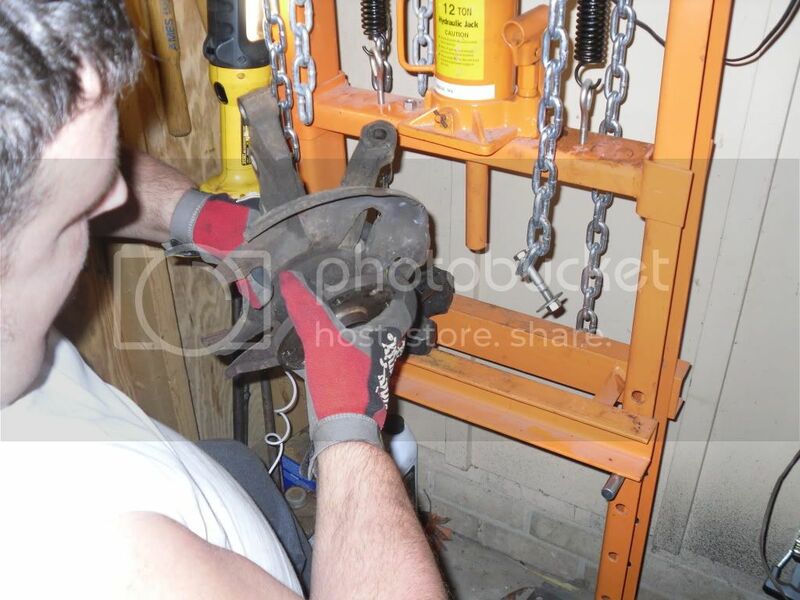 Remove the bearing and place it on a greasing jig. 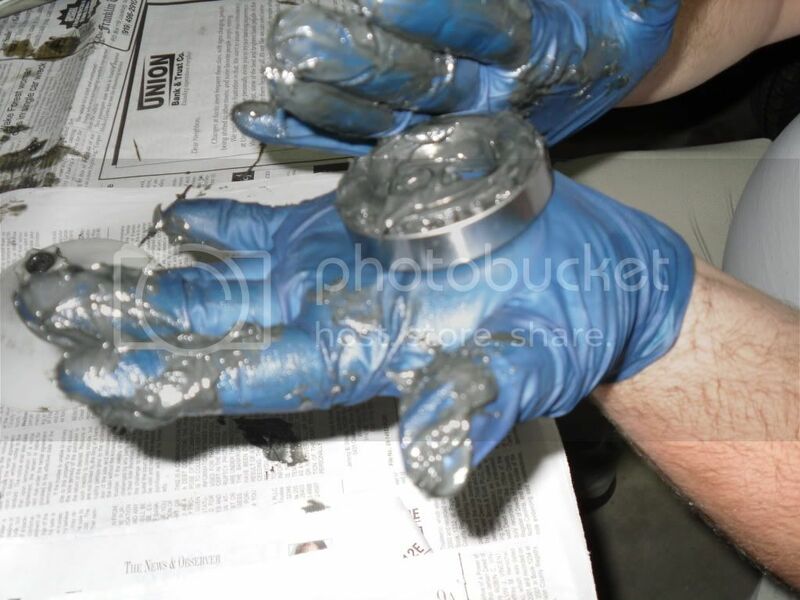 Tighten down the parts and get ready for some grease! 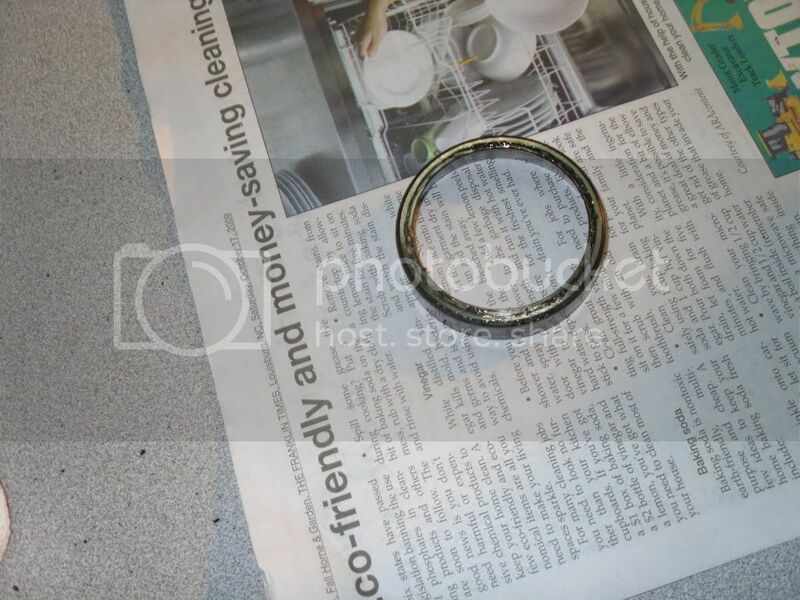 You'll see this and think you're done.. but in fact, look very closely to where the individual bearings are installed... you want to see a small bead of grease coming from around the bearing too. 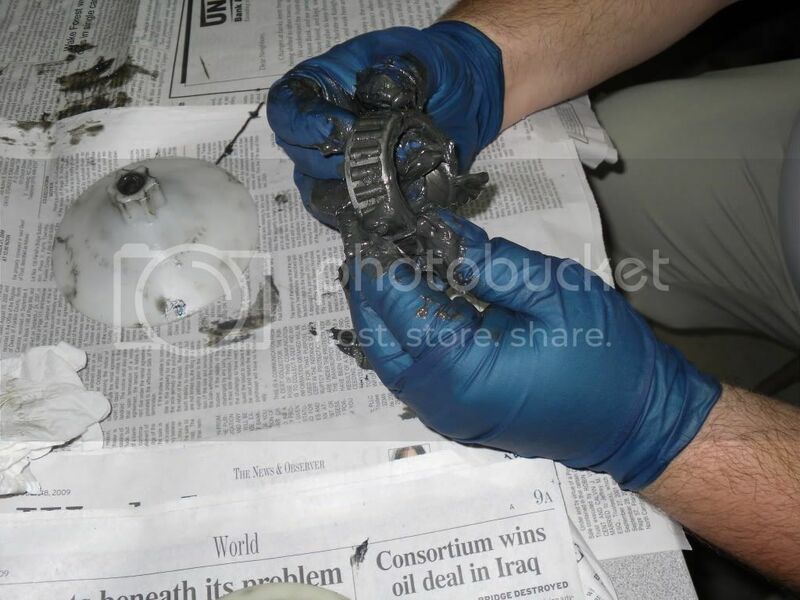 Remove and make sure the whole bearing unit is greased. NOTE: We kept each bearing and race together as they came in the package. 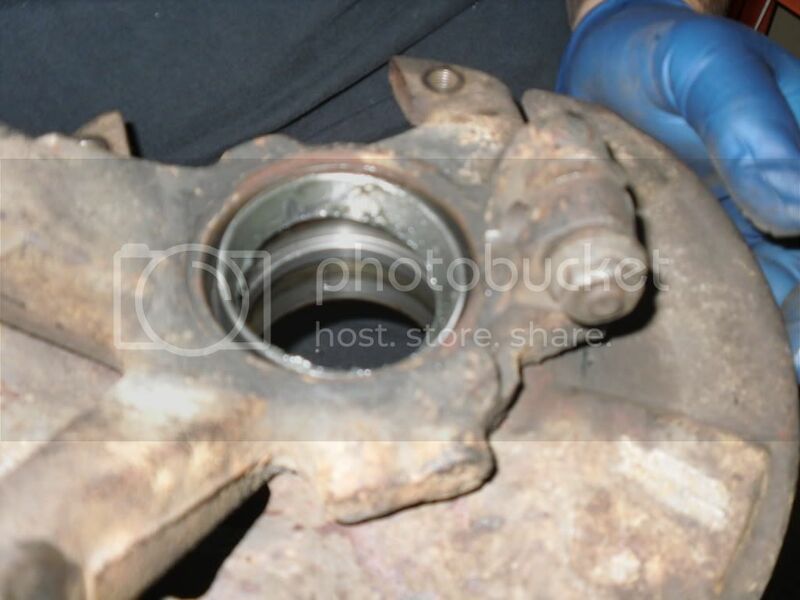 But in all honesty, they are identical for both the outer and inner bearings. 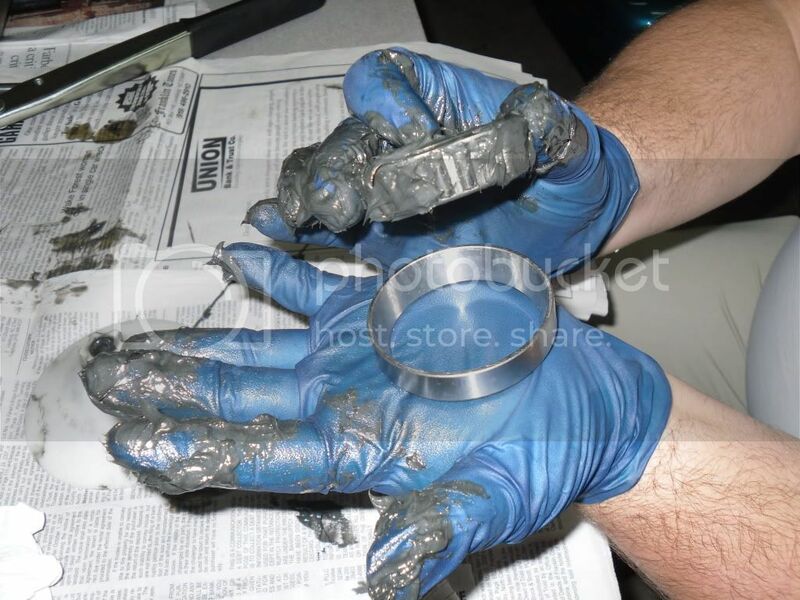 We repeated the process for the other bearing and race assembly too. 18. Now we are ready to reinstall the races! 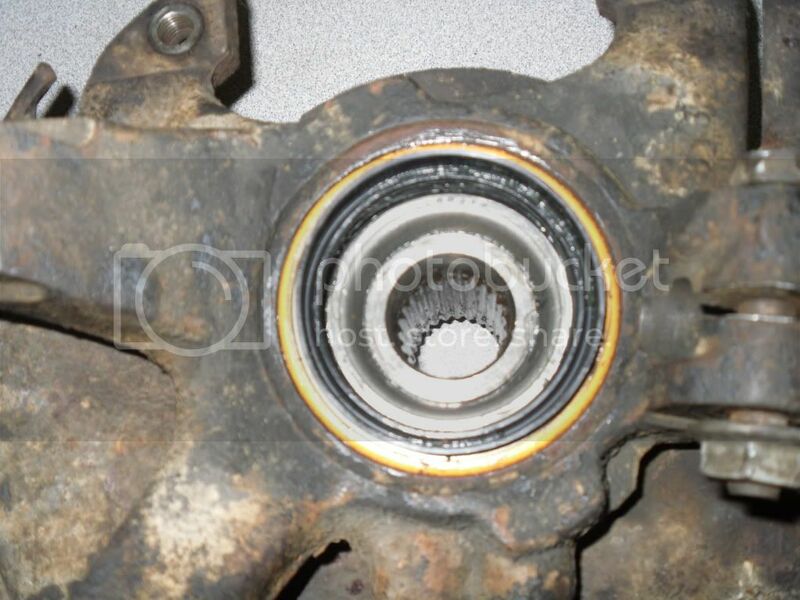 The inner bearing race went in first. We used a socket to accomodate some space... hey, we were getting tired and didn't feel like releveling everything! 19. 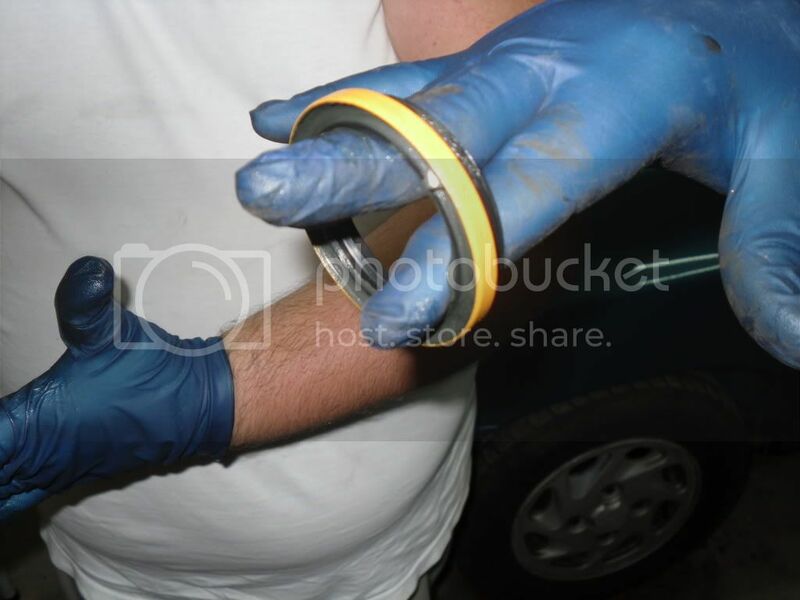 We installed the inner bearing next. 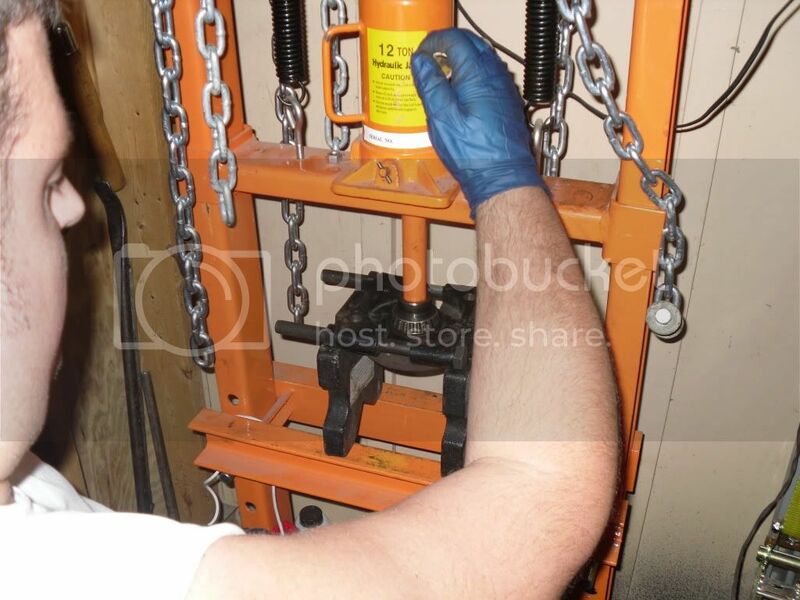 And did the same as above...we used the press to install it. 20. 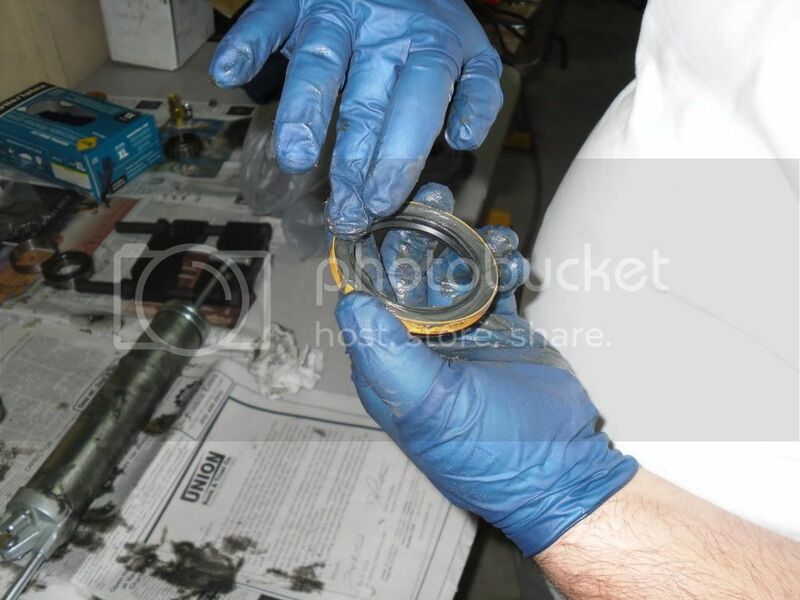 Then we installed the inner bearing gasket. There was some debate over whether we should have waited to put this on until last. It was already on by the time the debate started. This method worked for us, but you want to install this as the very last thing to complete the project. 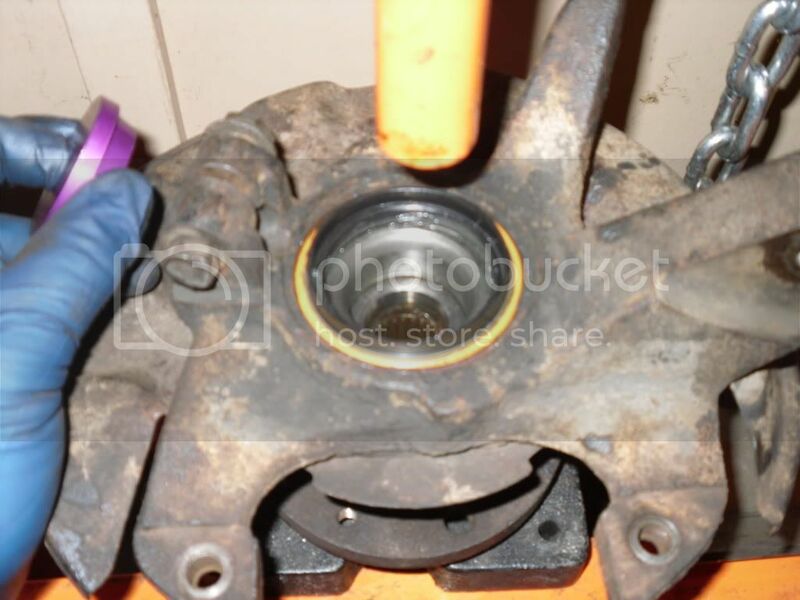 Make sure you put grease on the gasket area here too. Don't want anything getting into your new parts! 21. 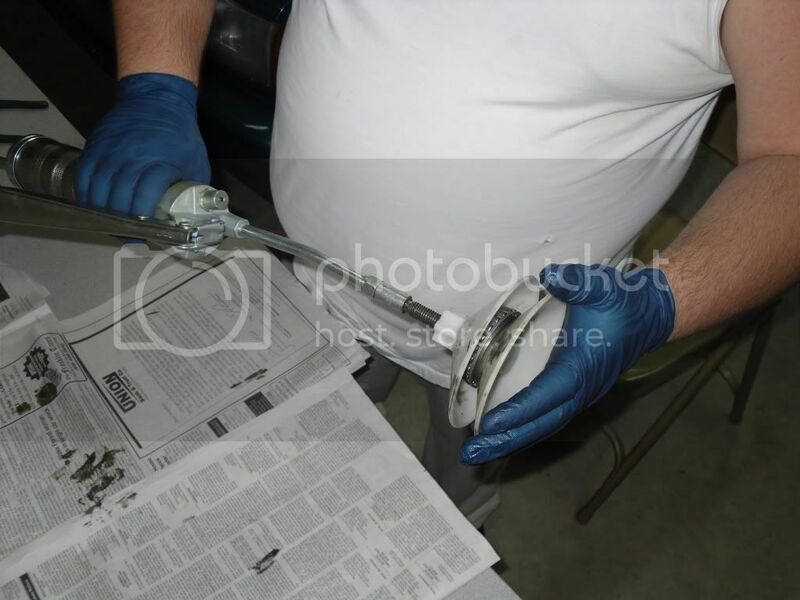 You are now ready to install the outer wheel bearing race! Make sure it's level! We switched to a smaller adaptor to finish pressing in the outer race. 22. 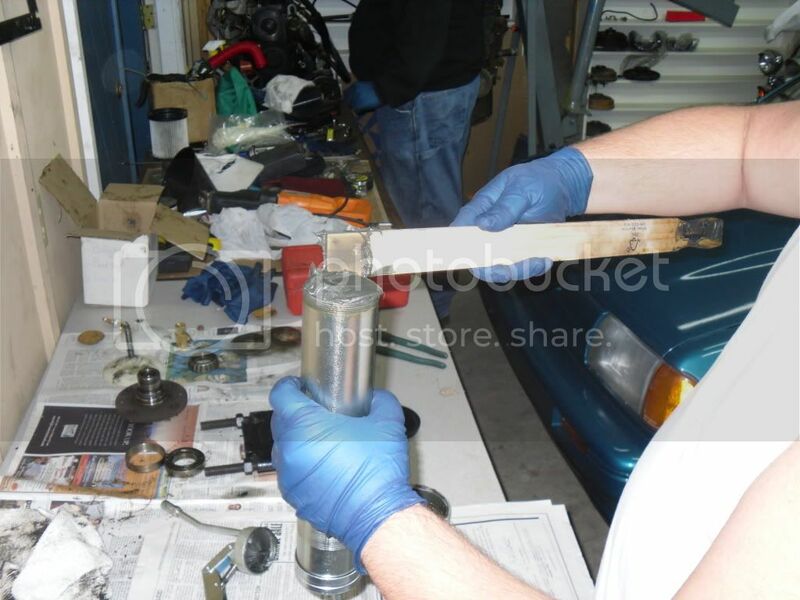 DON"T FORGET TO REINSTALL THAT SPACER!!!!! 23. 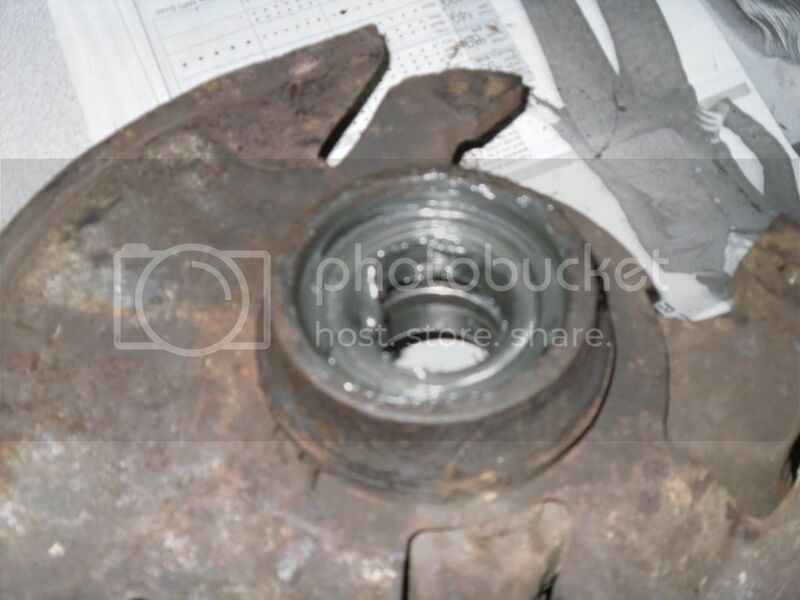 And we pressed in the outer wheel bearing. 24. 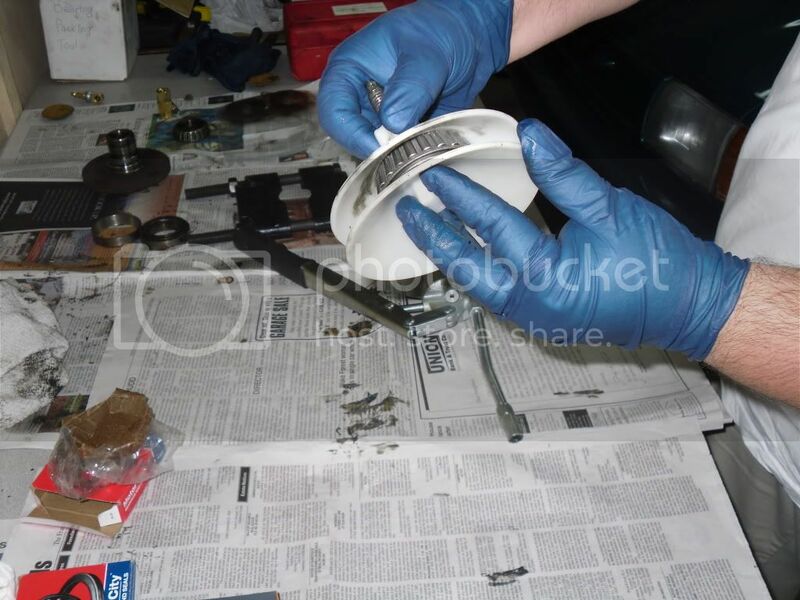 We greased up the seals on the outer seal the same way we did the inner seal. Then we gently tapped this into place. Again, alternating between 9 and 3 and checking progress frequently. Take your time! Now, all we have to do is reinstall the spindle. 25. Back to the press. 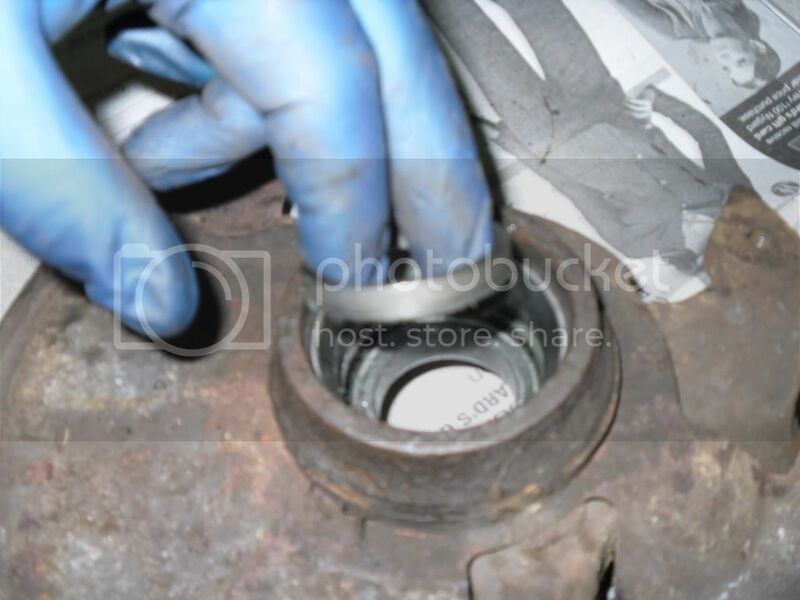 Remember how I said we made the mistake of putting on the inner seal too early.... How were we going to press this unit back together w/out damaging the seal?! 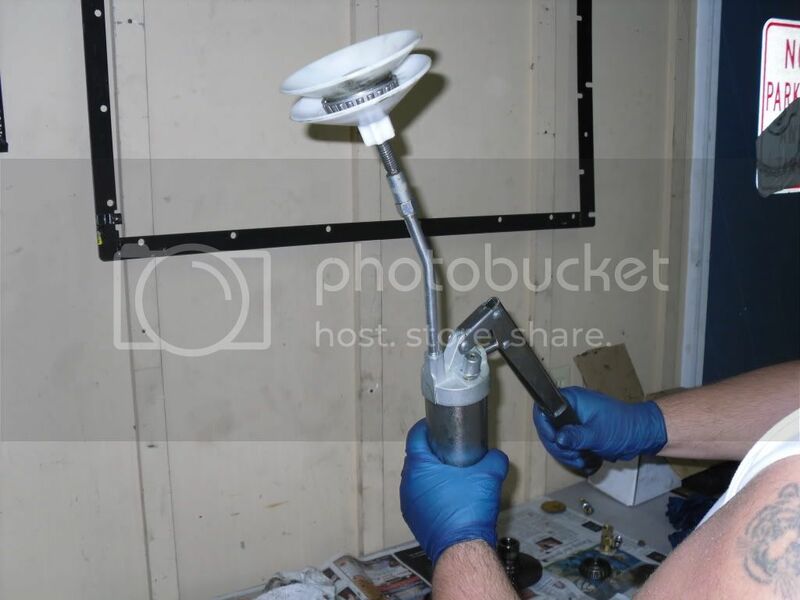 We came up with this solution... we used a smaller adaptor for the press tool and allowed it rest inside of the seal instead of on it. It worked! We were finally done!!! 26. We didn't take pics for the reinstallation b/c I forgot my camera. But, just review the first few steps in reverse order and you should be able to put everything back together. One tip though... turns out my tie rod ends need to be replaced. 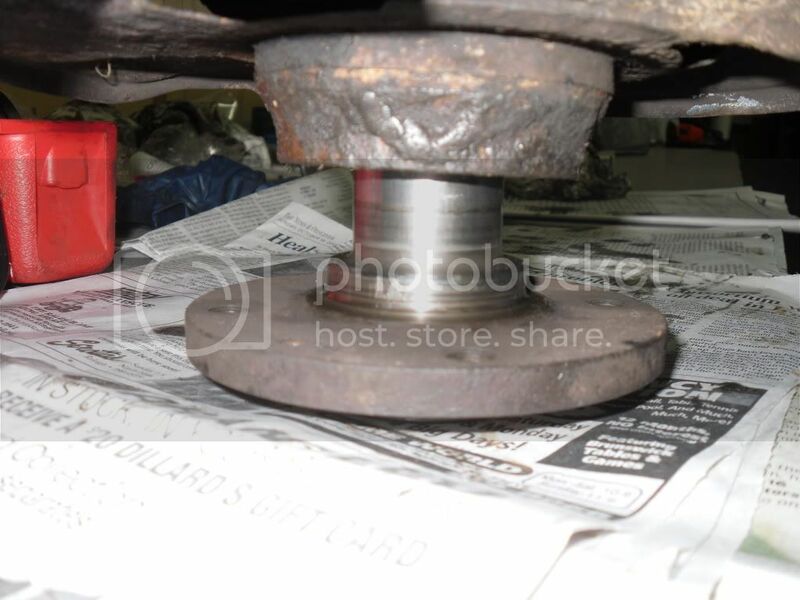 We had a hard time time getting the the bolt to retighten back onto the tie rod b/c the tie rod end itself kept spinning. For sake of this long write-up. Just know we used an air compressor and air gun to get the bolt to retighten. 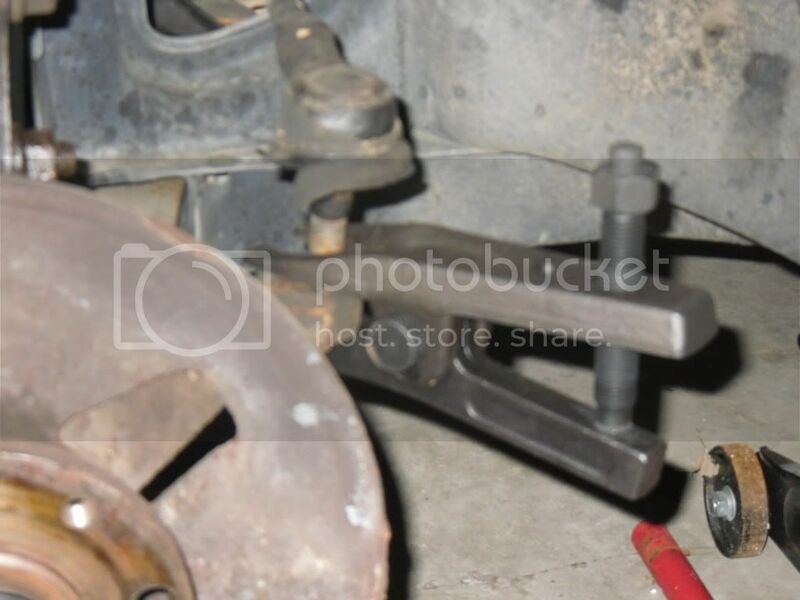 A new tie rod end is in the works for me! Very nice write-up... Good info... this should make a sticky! The normal is not always normal... MOST is not ALL... And any job can be hard if you don't have the right tools!!! 89 L 4spd (Daily Driver(if it isn't broke down)) "Spanky"
Great work! You just hired yourself in a new part-time job. I'm sure people will want you to do theirs too (for compensation of course). Definitely sticky-worthy. Last edited by TominMO; 11-23-2009, 11:57 AM. You have learned much in a short time. The wife and I are attending this meet. Come convoy with us.Come to the 1st annual "Sunshine Meet" March 20th 2010. Details in the thread below. 3rd Annual Festiva Madness. 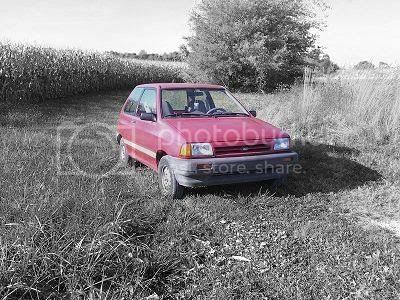 The largest Festiva Meet ever held of owners and their cars 2009 Festiva Madness link with pictures. 51 Festivas & 4 Aspires from eight states attended. I can't take all the credit... I really had two great mentors, Dean and Sam! And of course, a special thank you to Angela and Dan for allowing my car to set in their garage for two weeks! And Barbara for taking the pics when my hands were greasy! Honestly, if we hadn't been doing so many other things at the same time and had to coordinate our schedules for work time, we probably could have finished it in one day. Last edited by Britstiva; 11-23-2009, 03:03 PM. Great write-up, Jeremy! Well done! A genuinely enthusiastic young man. You have learned much, young Grasshopper. Focustiva: Because I was told it was was impossible to fit a Focus bumper on a Festiva. Great Write up!! Nice work!! 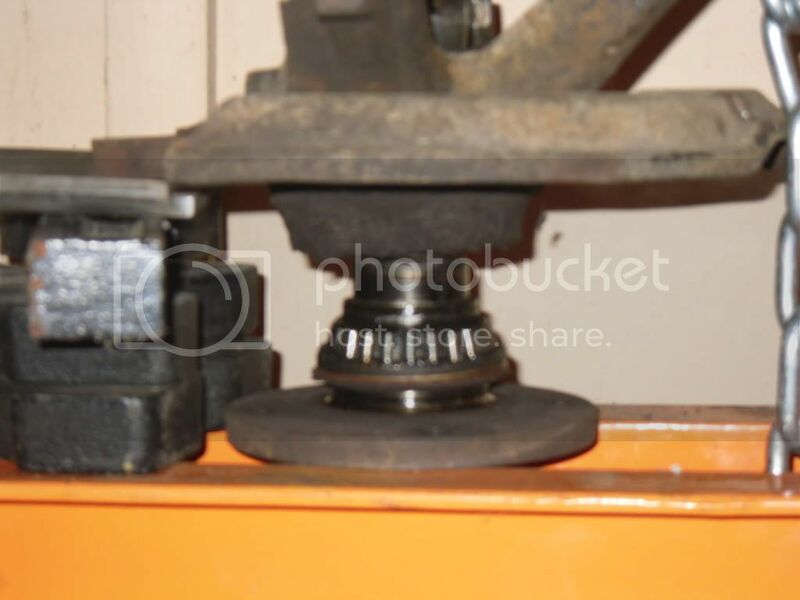 Those bearing press adapters look awfully familiar. Glad you got to use the 'Pretty in Pink" one. +1 on this being a sticky! 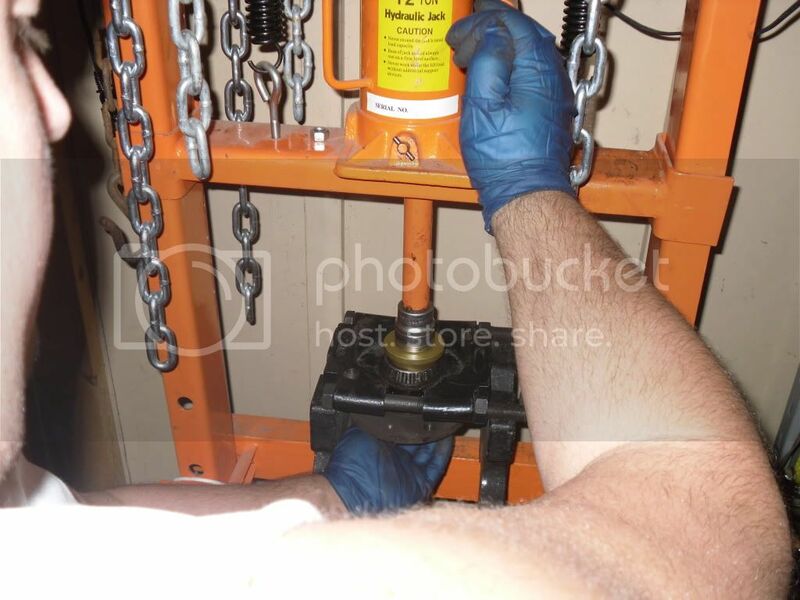 You do not need to worry about the tie rod moving....there is a lock not holding it in place on the threads and the other end is just a ball and socket. (unless the Aspire is different then the Festy). 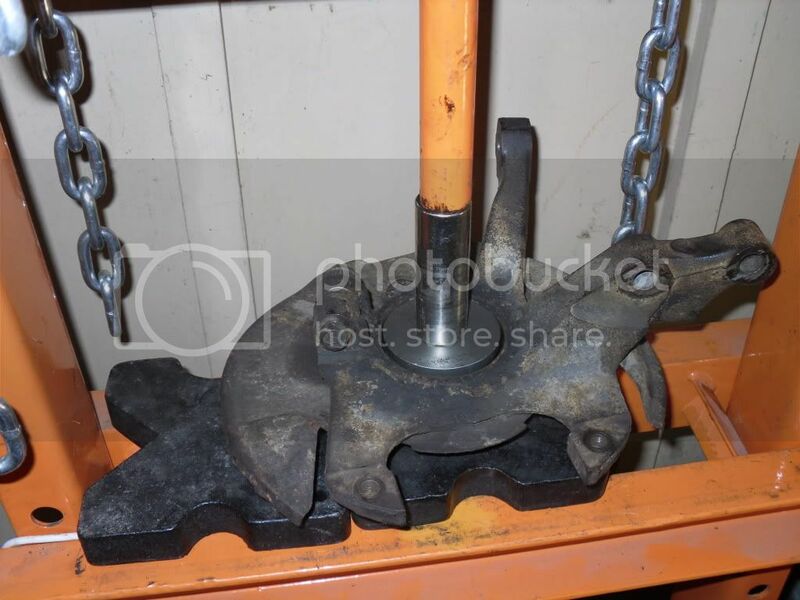 And 1 other thing....unless you are replacing the tie rod or the boots are already wasted I would not suggest using the pickle fork. 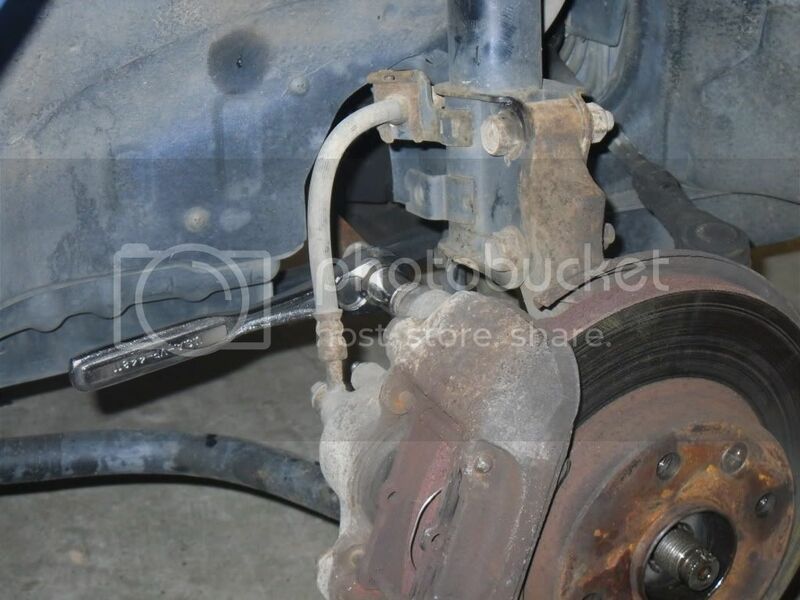 You can pop the tie rod loose by sharply striking the tab the tie rod is mounted through....might take a few hits but it will pop out and saves the boots from tearing. I will sleep when I die! I'm a little hunk of tin, nobody knows what shape I'm in. I've got four wheels and a running board, I'm not a Chevy, I'M A FORD! Thank you! 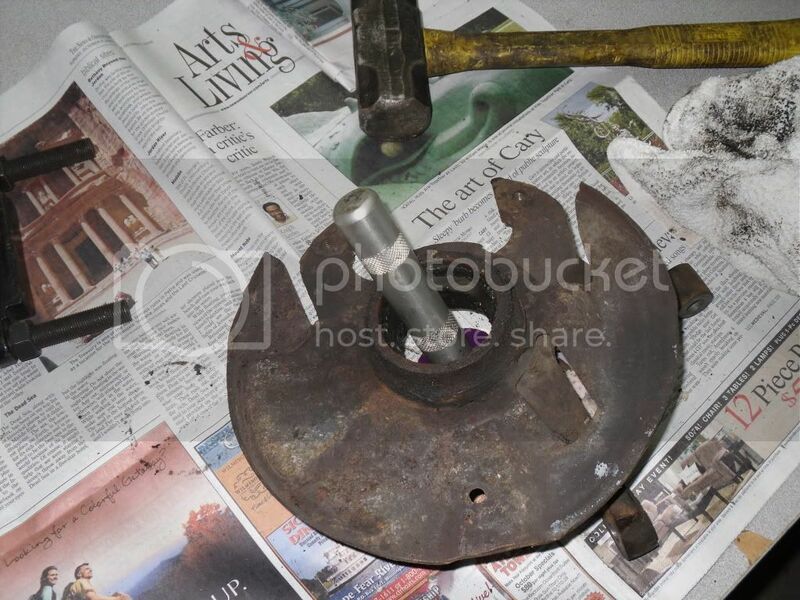 I tried using a rubber mallet and was striking the bolt from underneath to knock it out. But after about 15 min of that, I gave up. My boots were already shredded, so using the fork didn't do any further damage. So, a 56K friendly write will come soon! 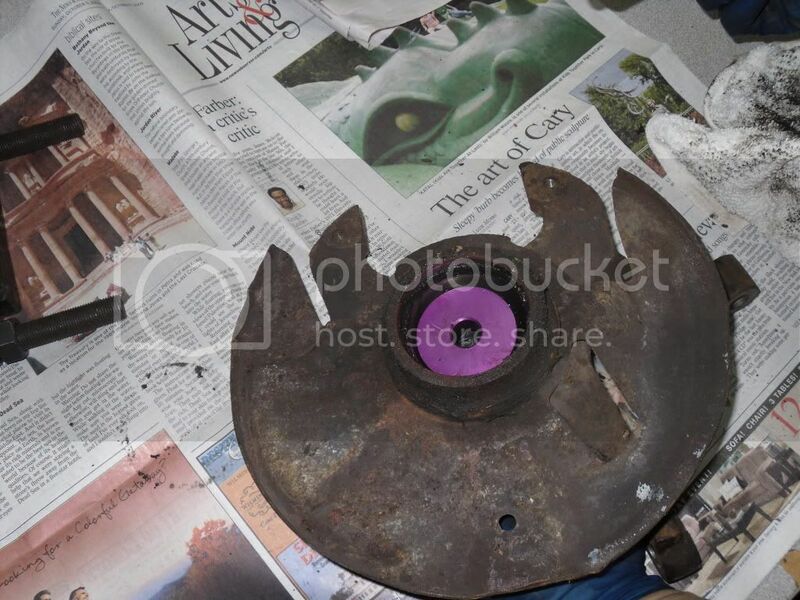 write up is fine....it is just pics need to be resized....also...a rubber mallet will not do the trick. I was talking of a 3lb sledge or something close.